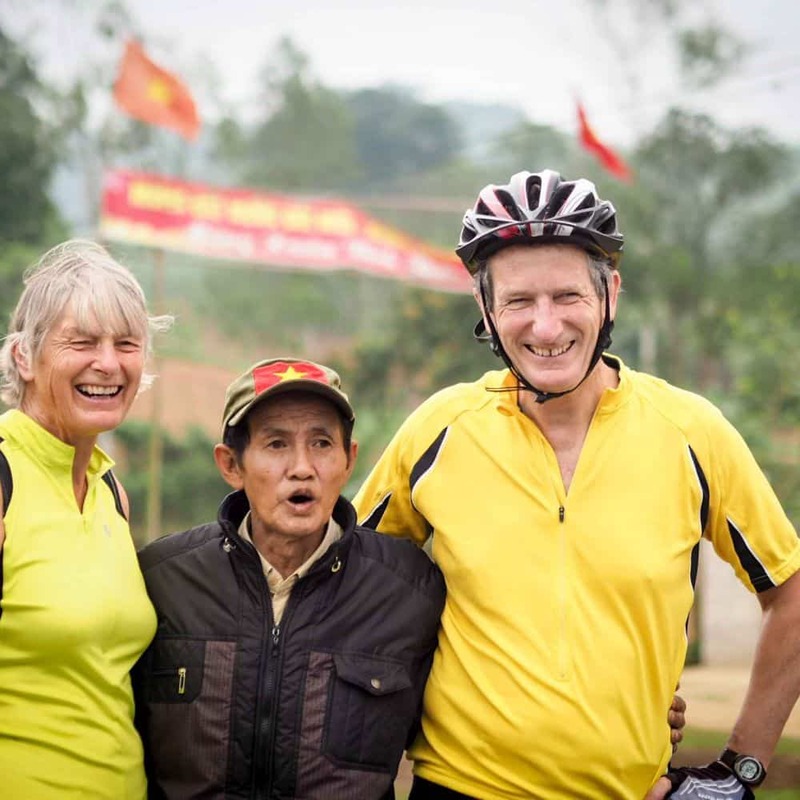 Our Central Vietnam cycling tour travels on frequently deserted back roads and trails through a quiet, beautiful region of Vietnam little visited by western travellers. 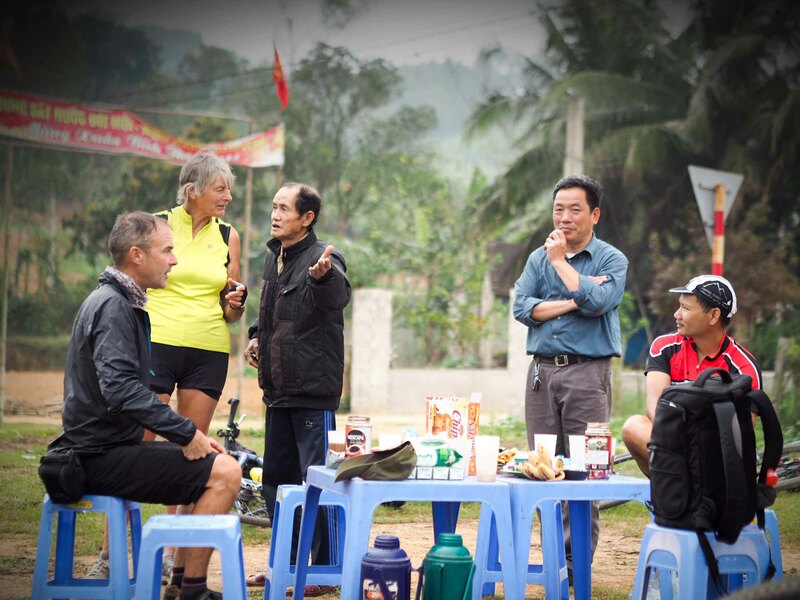 The tour will be supported by one or two vehicles (dependant on group size), a local guide (Phong), and a Western tour leader (David). 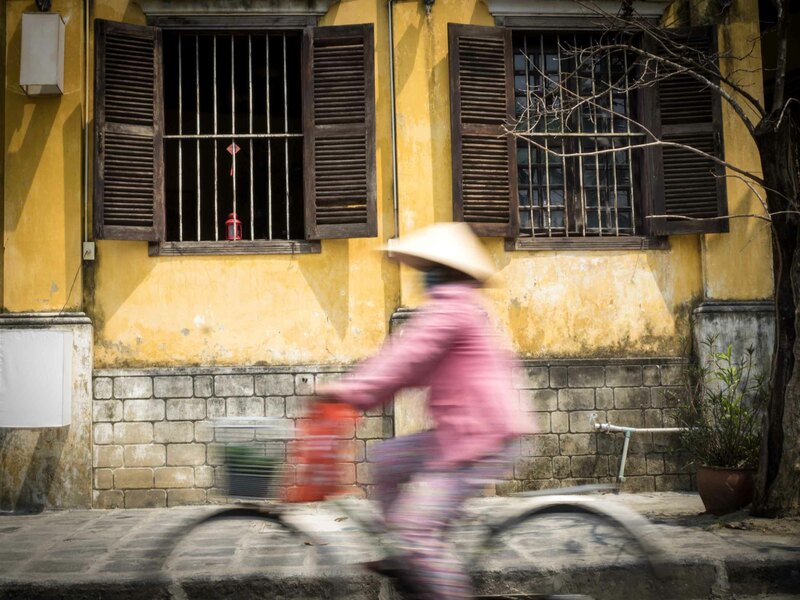 Hanoi’s bustling Old Quarter. 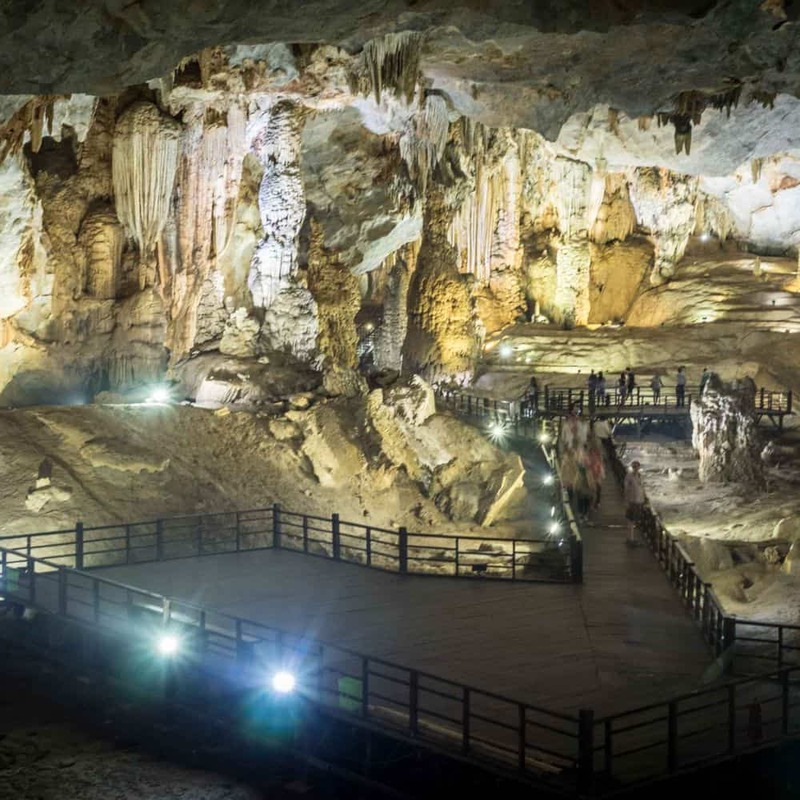 The opportunity to visit Phong Nha’s Paradice Caves. 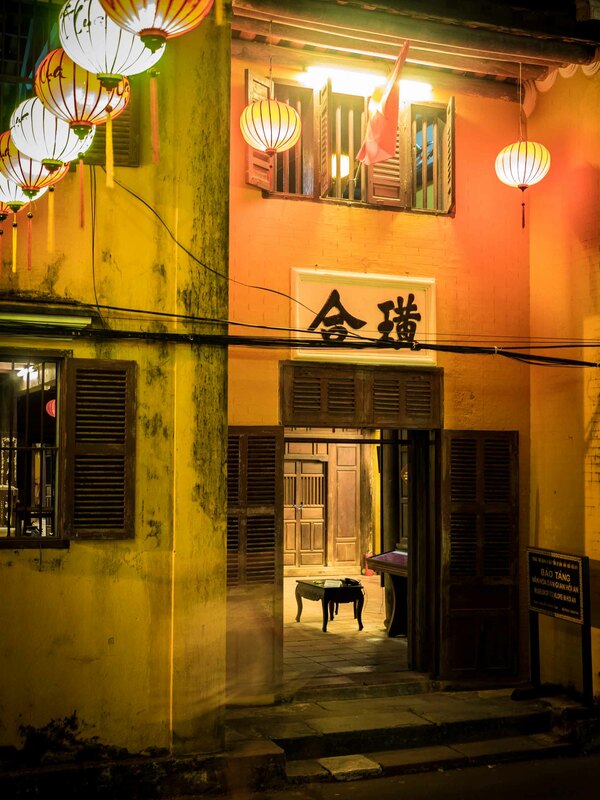 The lovely World Heritage town of Hoi An. 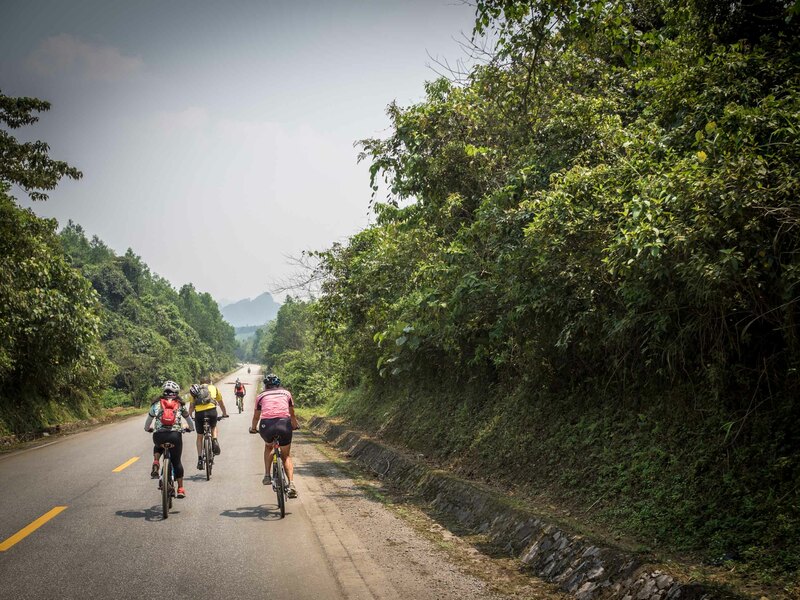 Huge swathes of wilderness and quiet roads. 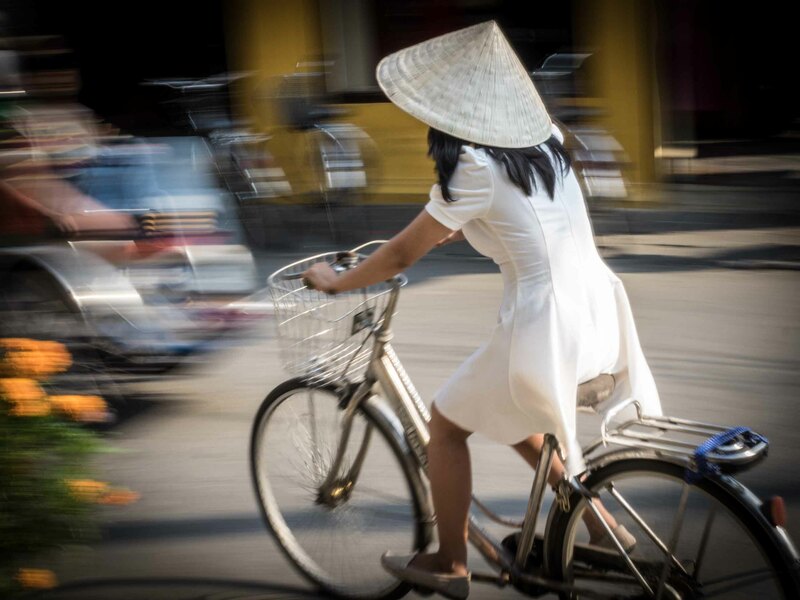 And above all experiencing a region of Vietnam away from the mainstream of tourism from the finest vantage point a traveller can have - the saddle of a bicycle. 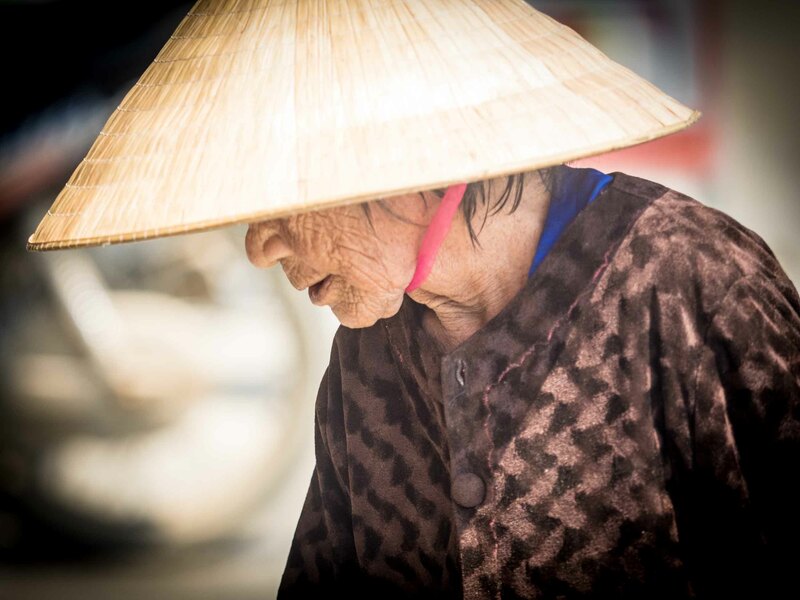 A great trip with lots of variety in scenery from hustling busy Hanoi to rice paddies and farmland, followed by mountain scenery and lush thick jungle, to finishing with a relaxing day in the quaint old town of Hoi An. 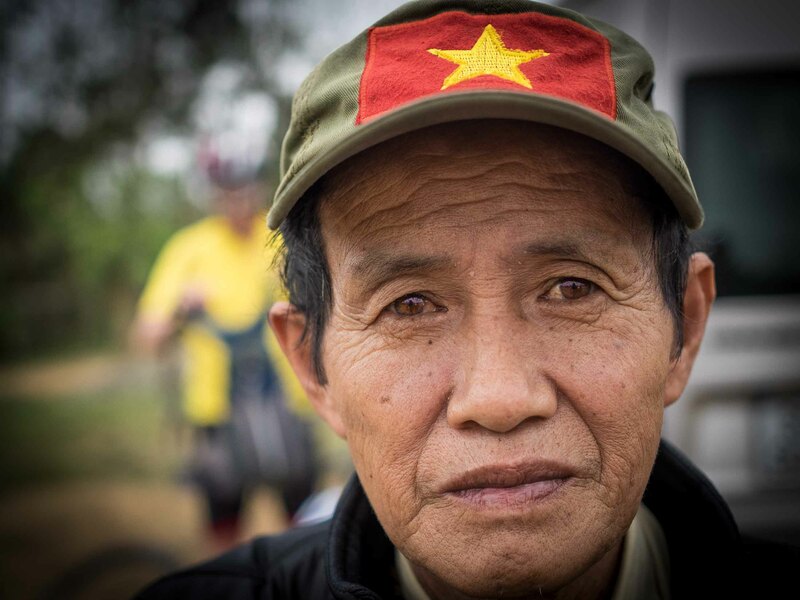 Hearing about aspects of Vietnamese history and stories of the war from the Vietnamese guide Phong was fascinating and added interest and meaning whilst riding along the Ho Chi Minh trail. 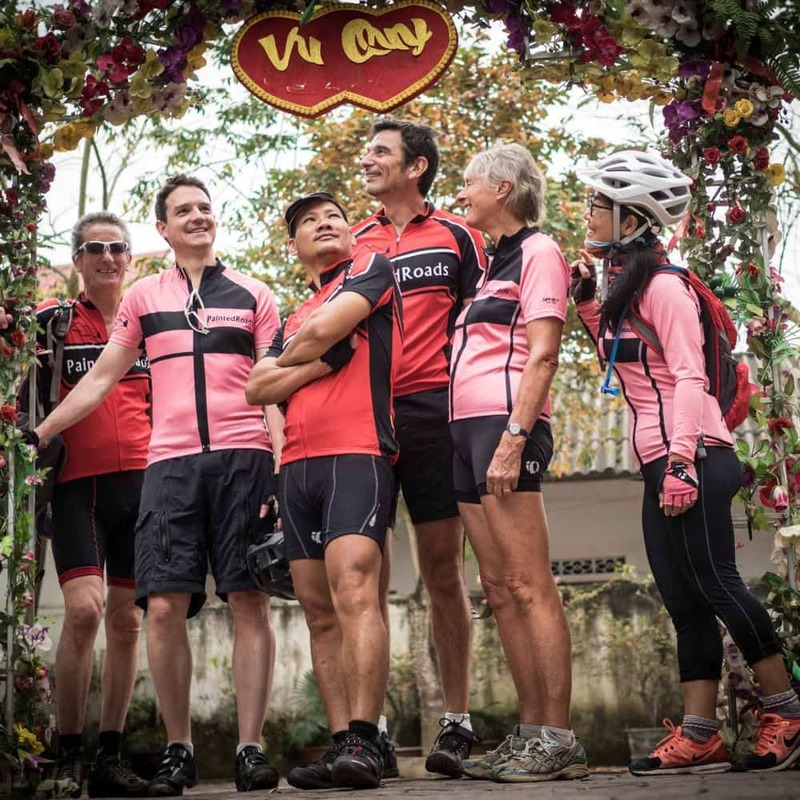 The back-up team of guides and driver were as welcoming, helpful and cheerful as ever, making sure everyone had a happy memorable holiday. 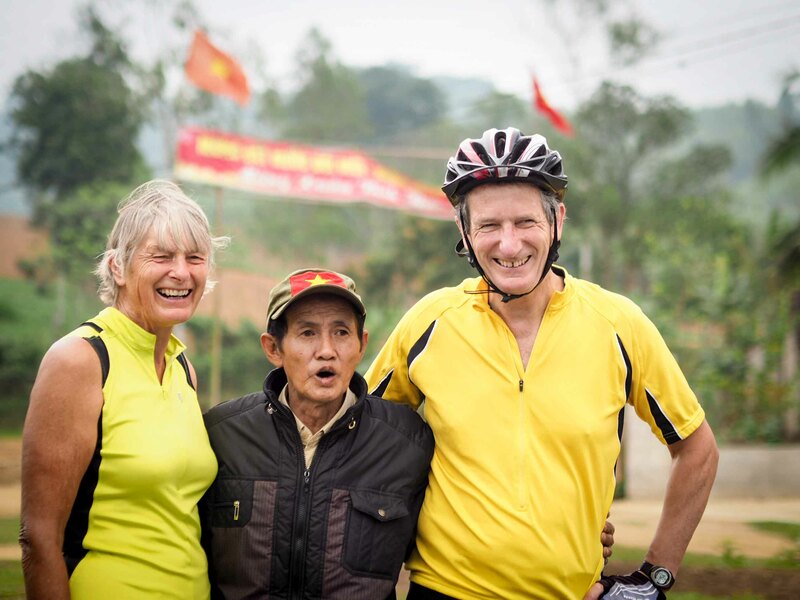 I would recommend this cycle tour to anyone wanting to see the real Vietnam in good company. 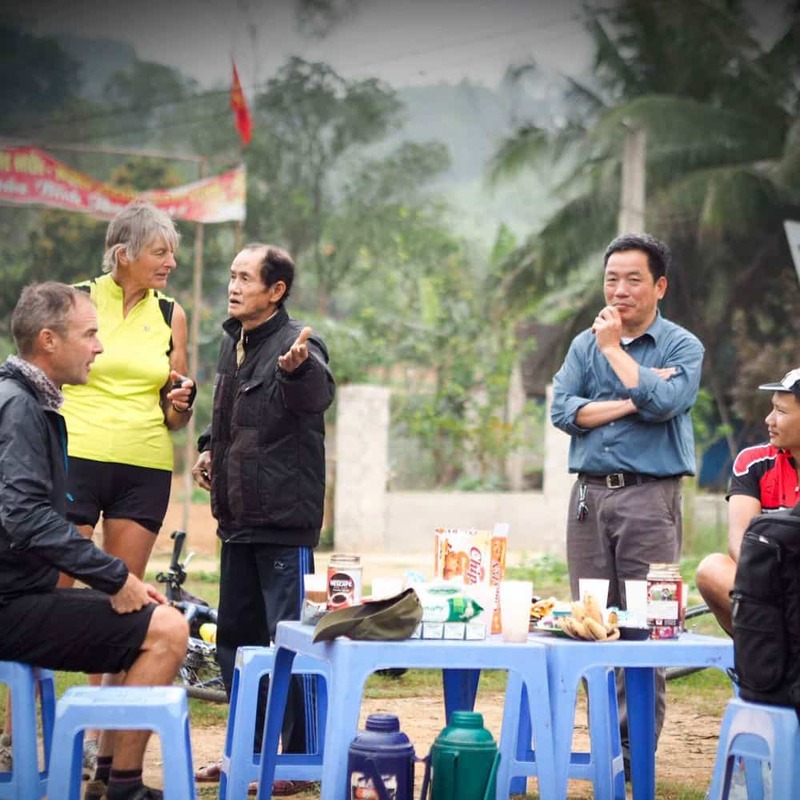 All accommodation, local guide and tour leader, support vehicle (1 or 2 depending on group size), meals on cycling days, snacks during cycling days, drinking water whilst cycling. 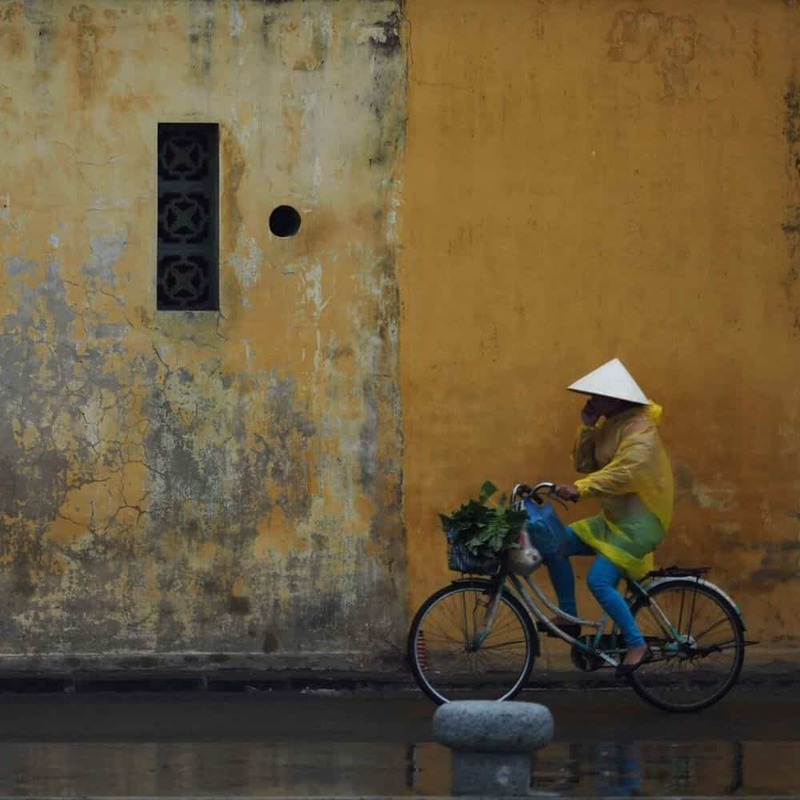 If you arrive at Hanoi's International airport on the first day of the tour you will be met there and transferred to our joining hotel. If you are arriving on another day or are not flying in please let us know so that we can help with arrangements. Full joining instructions will be given during the week before the tour begins. 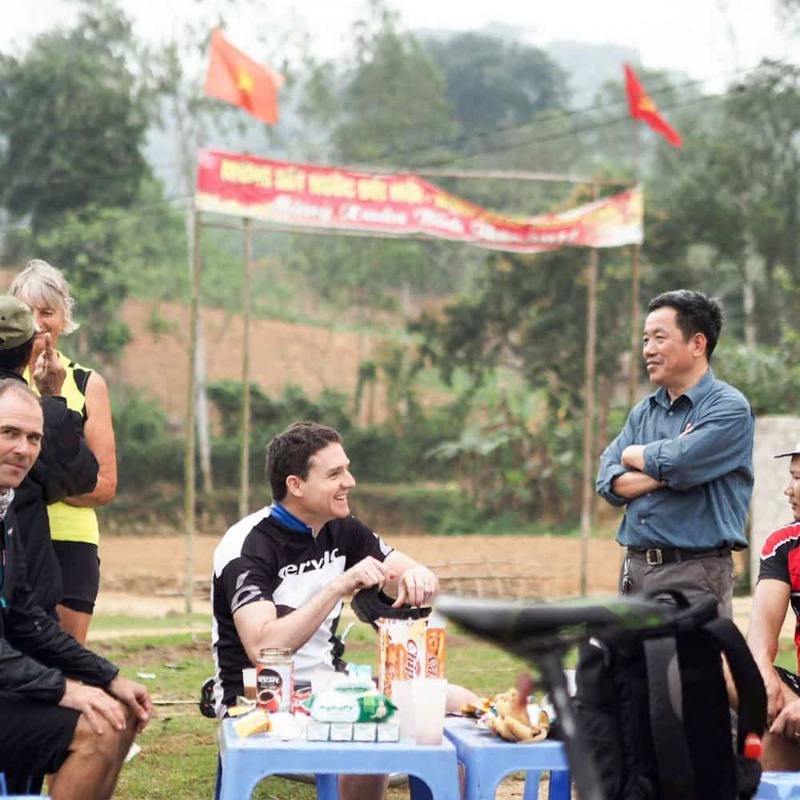 Typically though the group will meet the tour leader in the hotel lobby early evening (between 5 and 6) for a briefing drink and dinner. 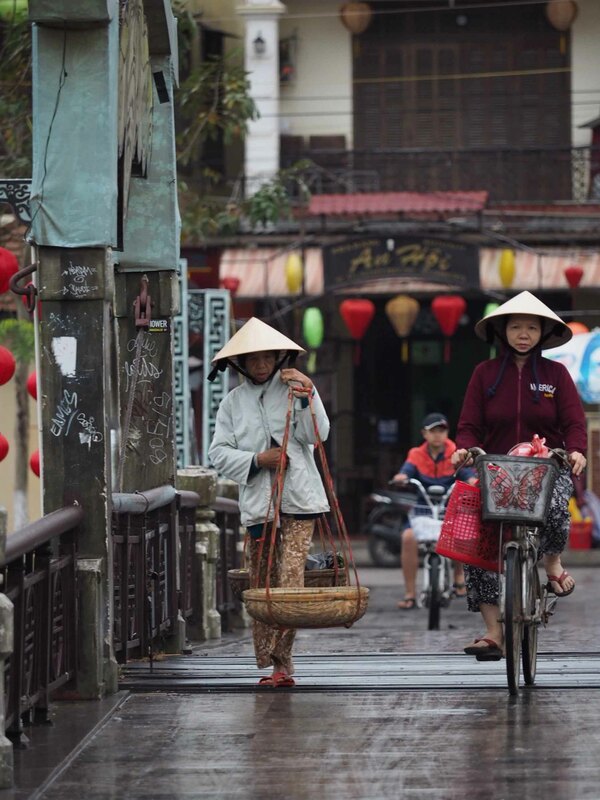 The tour finishes at the historic town of Hoi An. 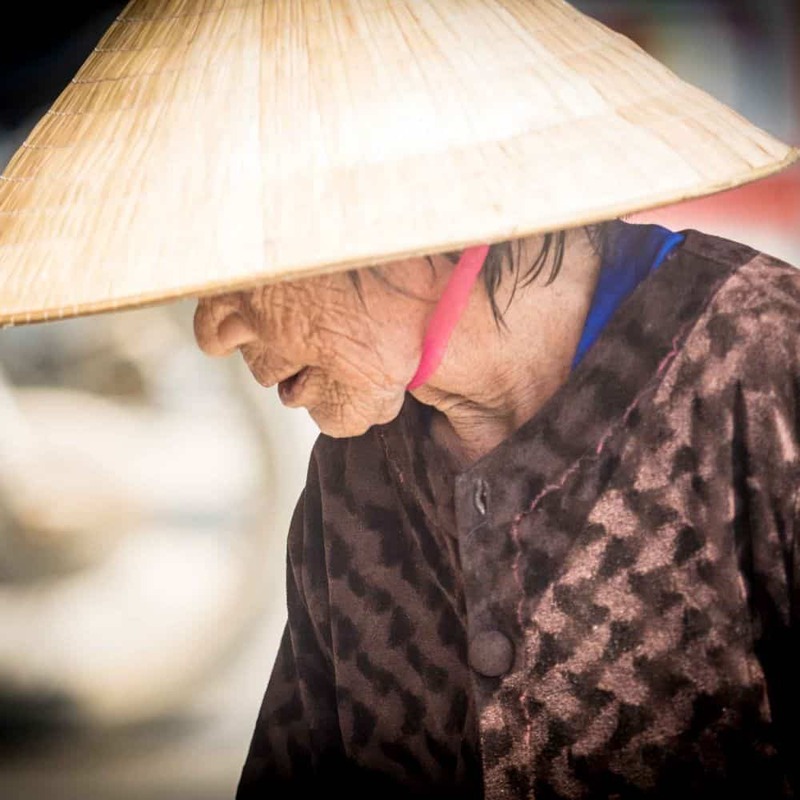 Should you be keen to explore more of Asia nearby Da Nang Airport offers flights to Hanoi, Saigon, Ho Chi Minh City or further afield. 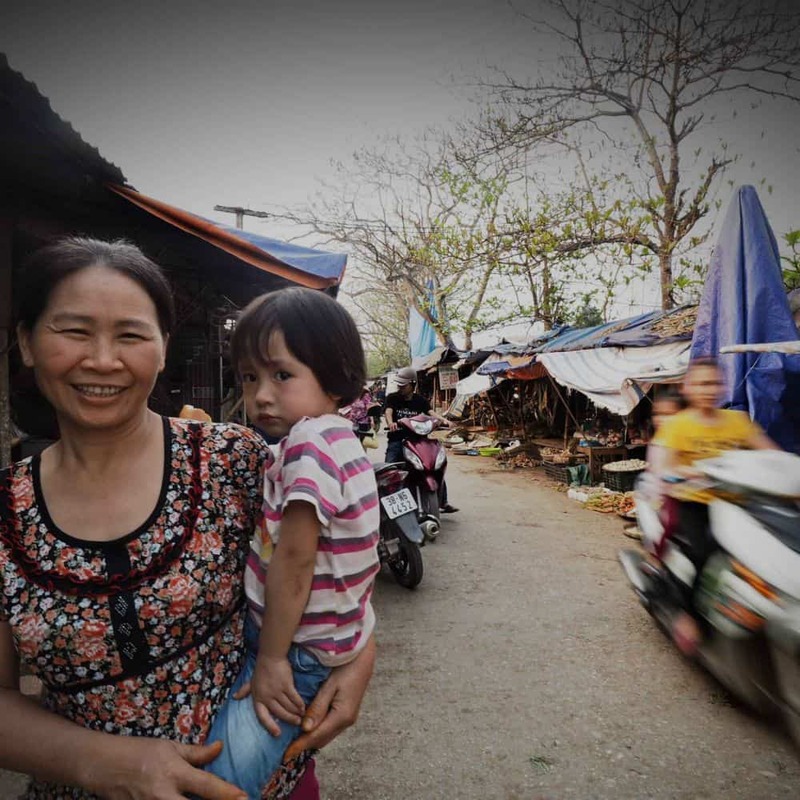 For those needing to return home quickly, there are regular flights with the Qantas Group airline www.jetstar.com back to Hanoi. 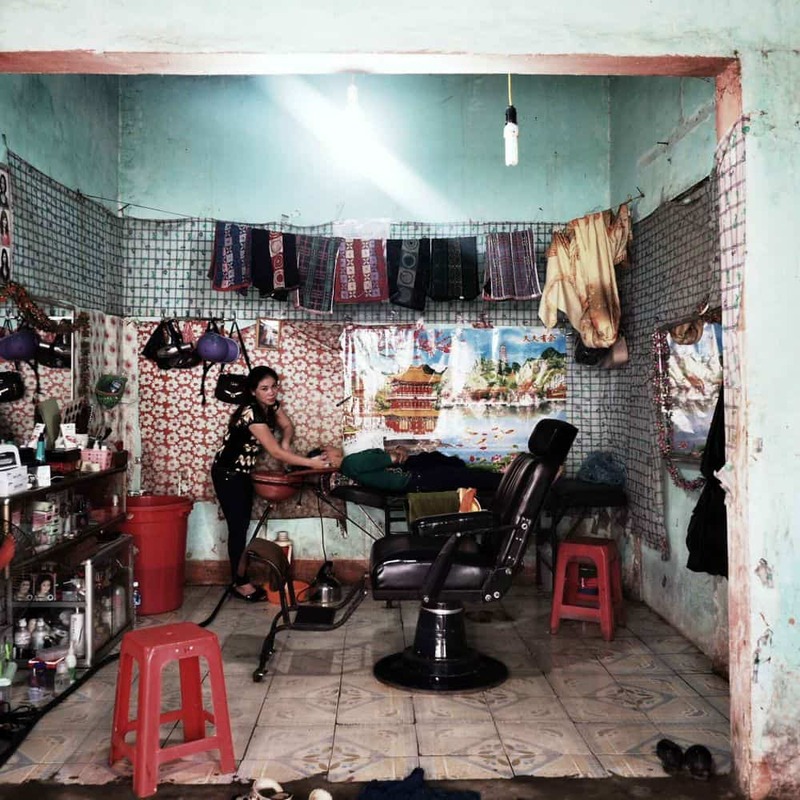 Please remember that the nearest airport is Da Nang. 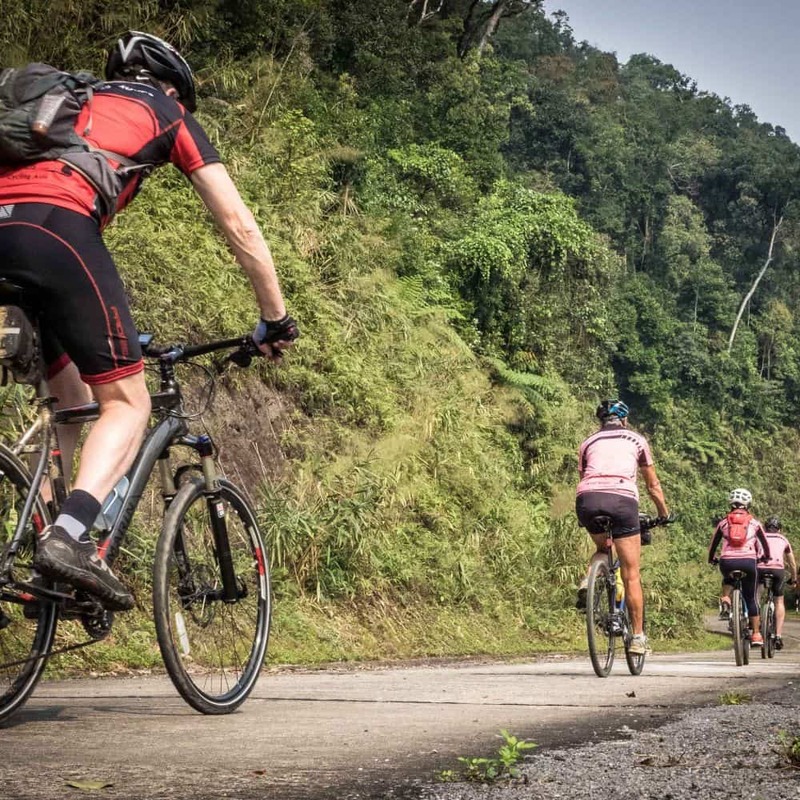 With an average daily distance of 97kms, this tour is for those who like to cover some distance on their bikes and is certainly not for novices. 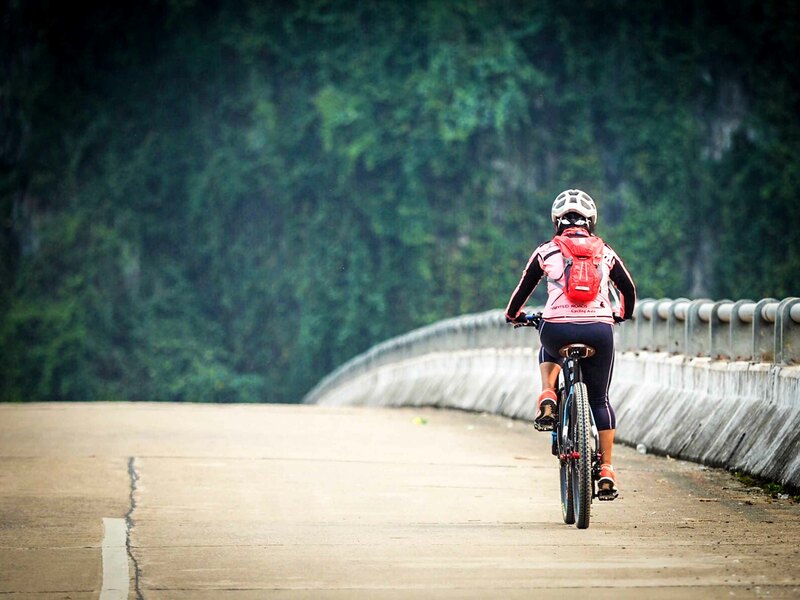 There are also climbs of 15kms or more. 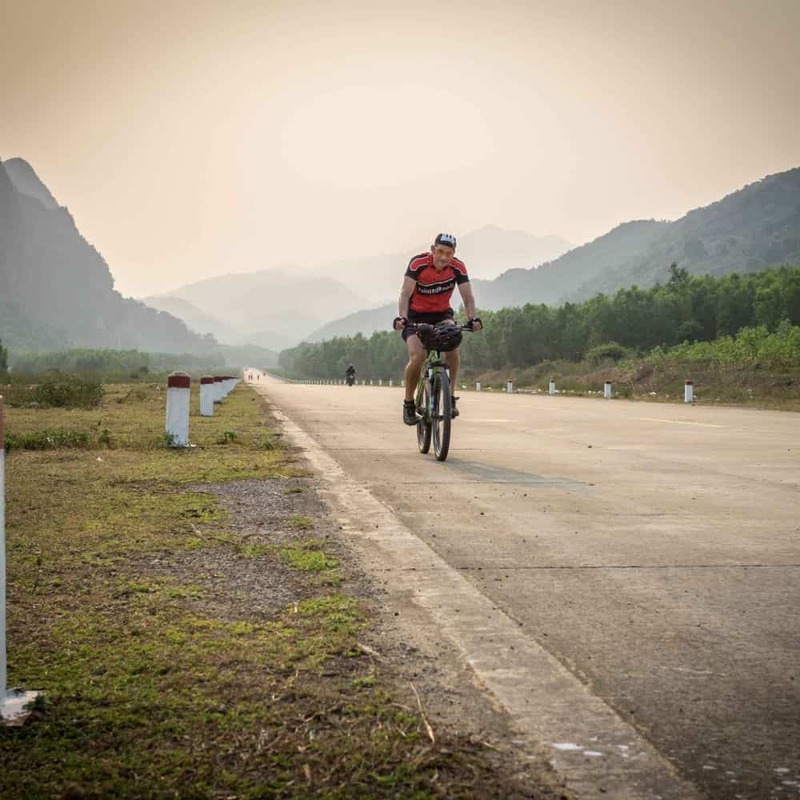 I undertook my first ever cycle 'holiday' with David Walker/Painted Roads by riding the Ho Chi Minh Trail tour in March 2018. 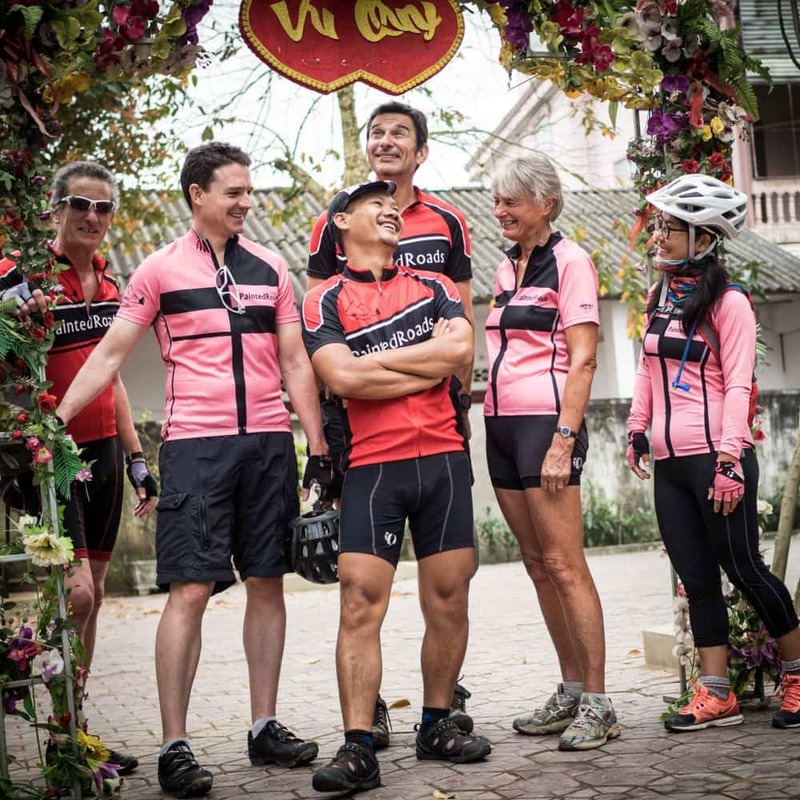 I didn't really have a holiday, instead what I did get was an adventure that far exceeded my expectations and included magnificent scenery, fantastic cycling, great food and top class hospitality. 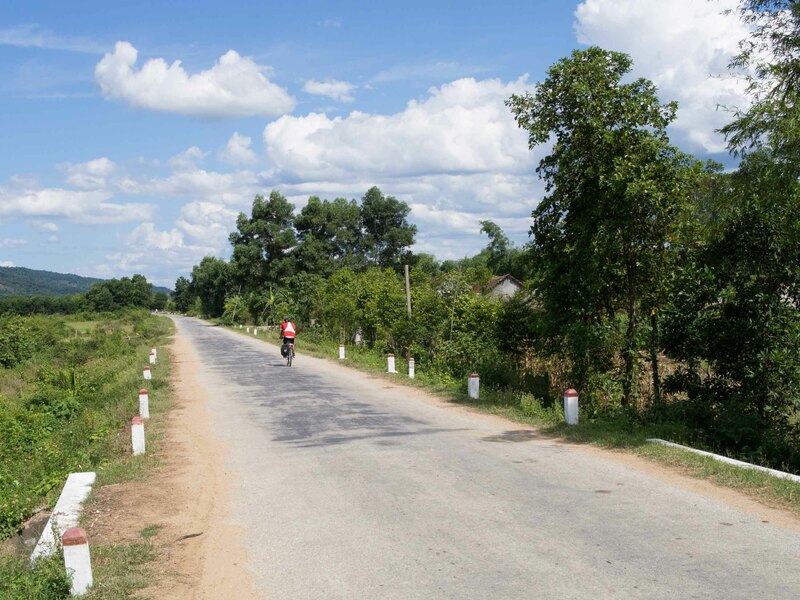 The roads on this tour are sealed and generally in good condition. 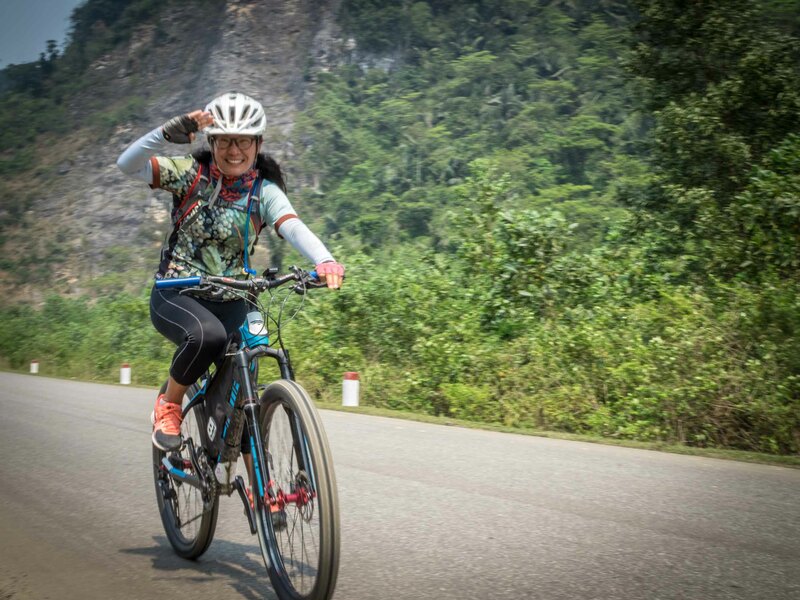 Most kinds of bicycle, except light-weight racing bikes, are suitable for this tour: touring bikes, mountain bikes, hybrids or cyclocross bikes are all fine. 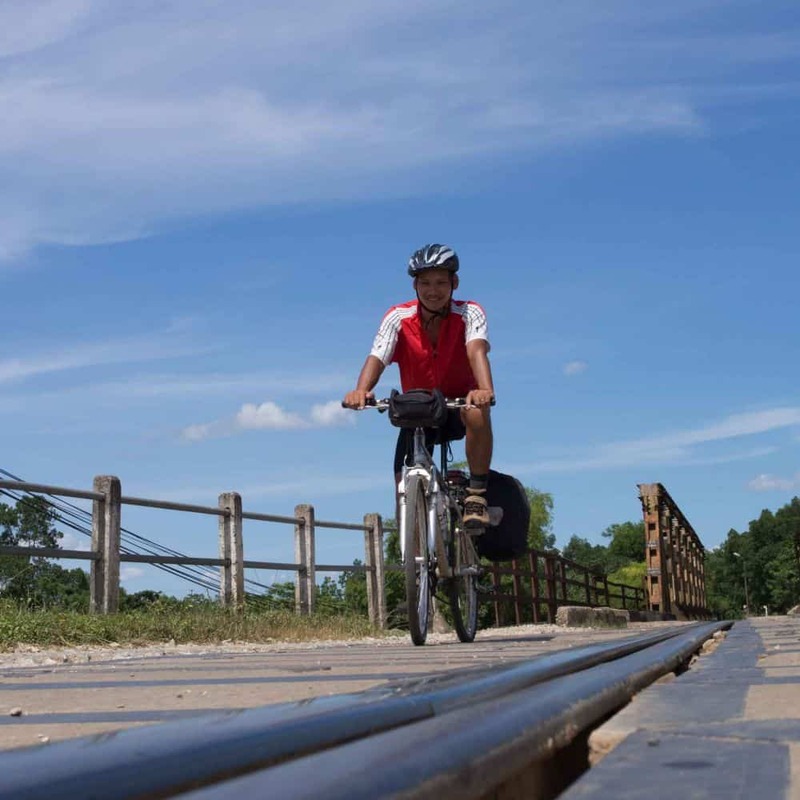 Road conditions vary from asphalt to gravel and some hard packed dirt tracks. Tyres from 35mm in width upwards will be fine but we recommend 40mm or more for comfort. 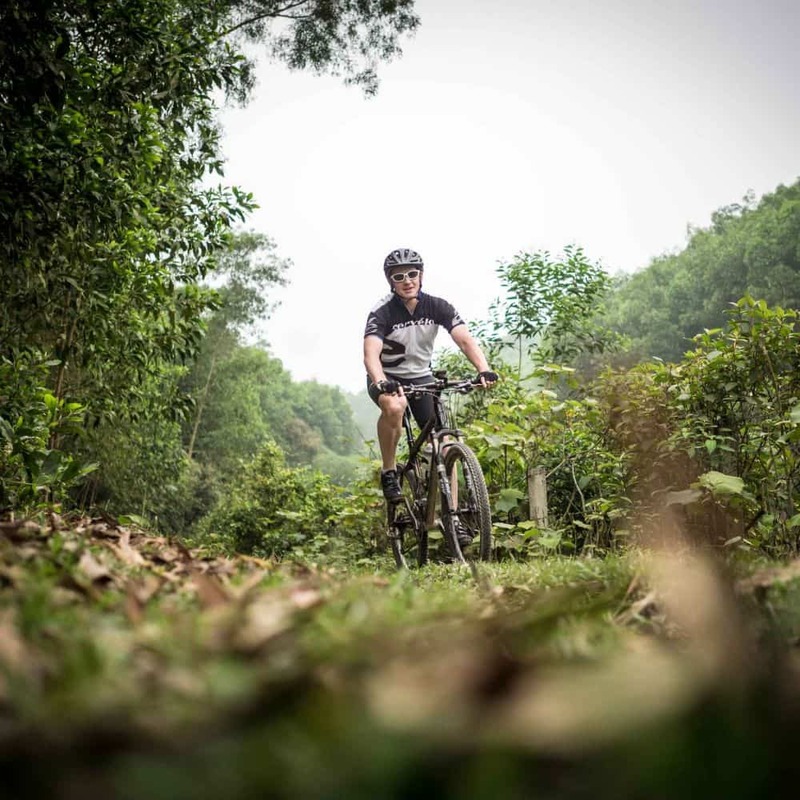 If bringing your own bike please bring along a selection of tools and spares specific for your bike such as few spare spokes, brake pads, a tyre and a couple of tubes, etc. If in doubt please ask at your local bike shop. 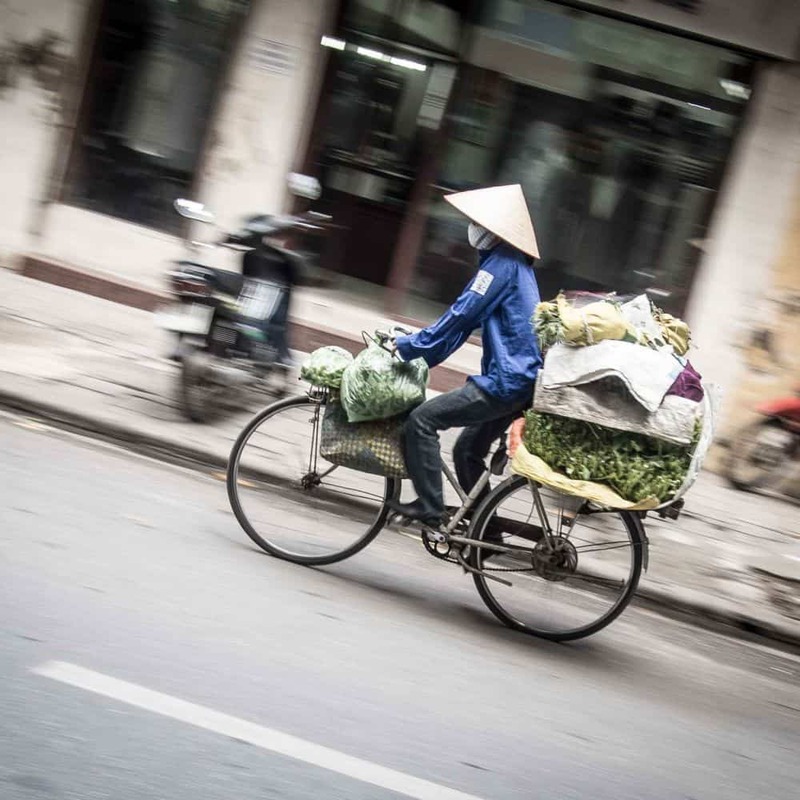 South East Asia is generally a warm place so the ability to carry one or two water bottles is essential (either on your bike or in a backpack). 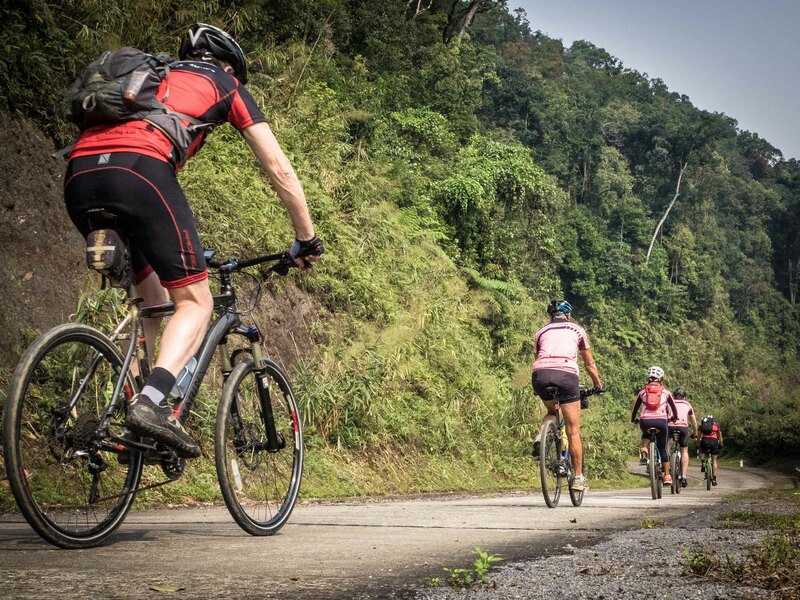 Our back-up vehicle carries water and tools although for those competent with tools bringing your own pump, puncture kit, and multi took is recommended as it would speed up repairs and minor adjustments. 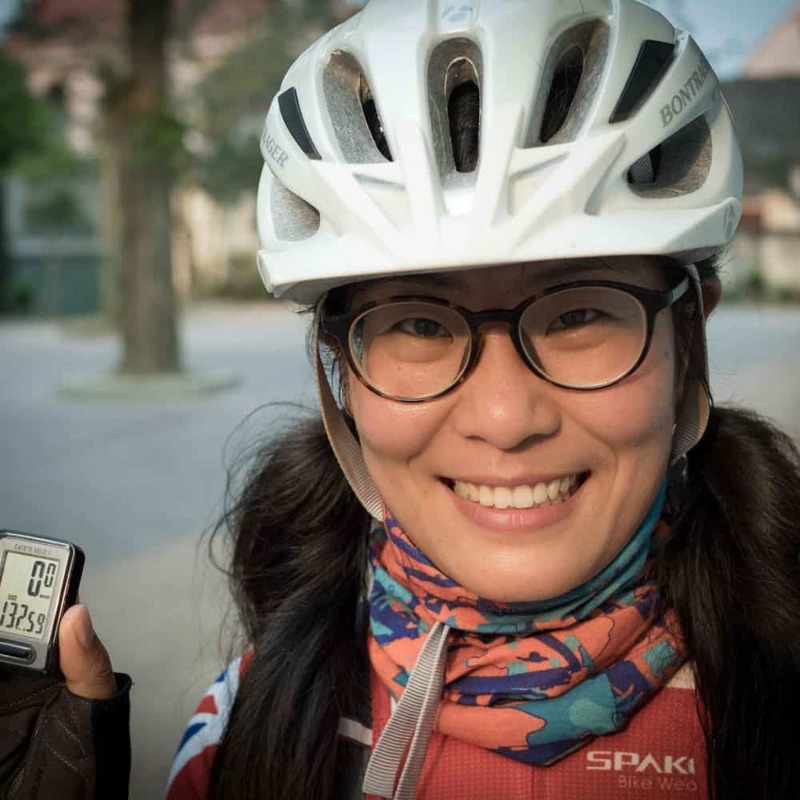 A means of carrying your camera, sunblock etc is also useful – either an on-bike bag, handlebar or saddlebag for example or a lightweight day-pack. 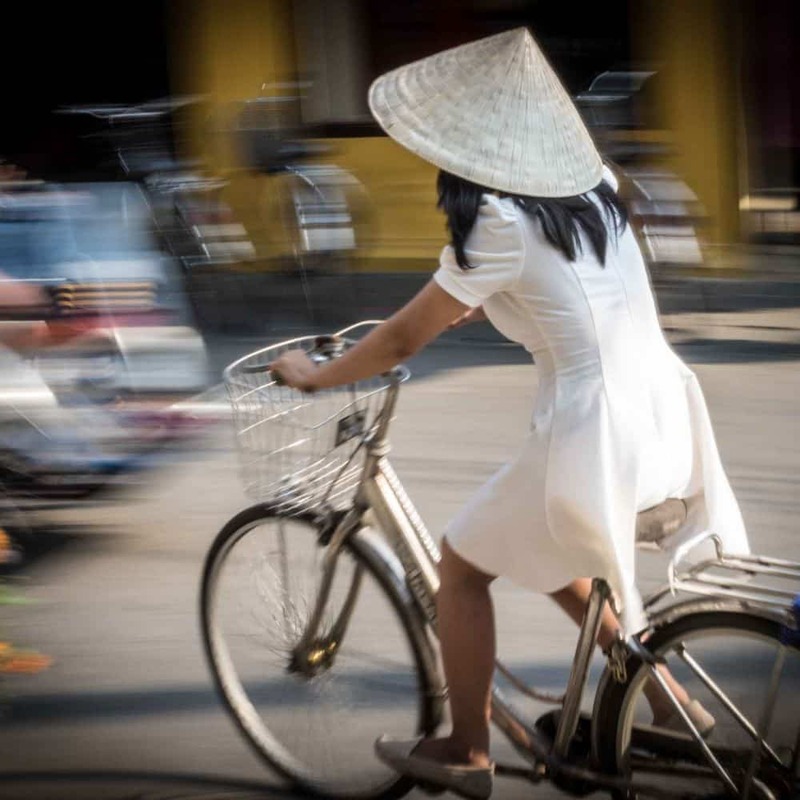 Although rapidly moving forward Vietnam is still a developing country and therefore one must not expect the same standards that may be found on a cycling holiday in Europe. 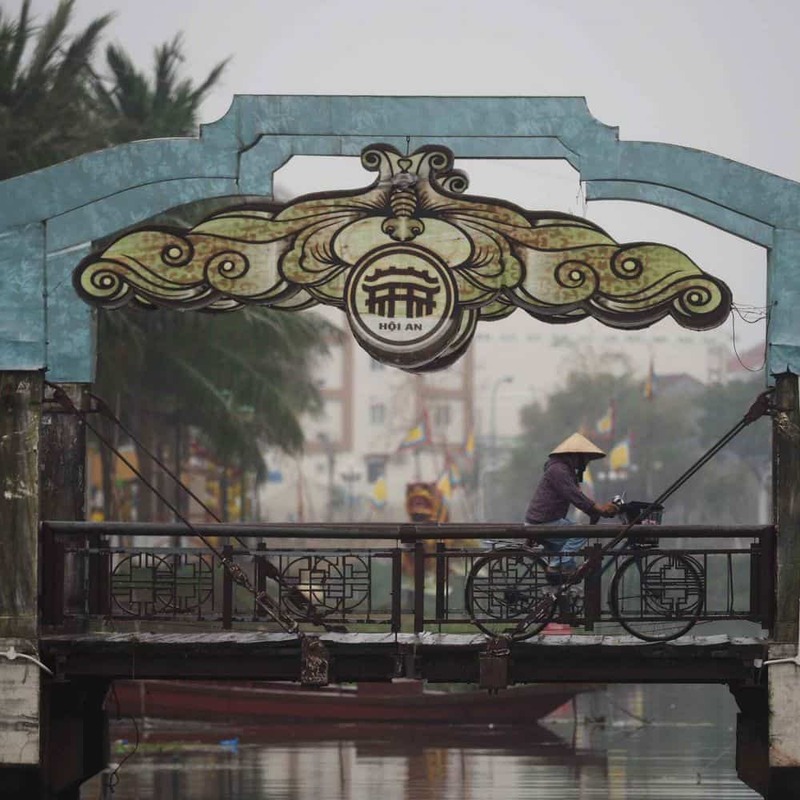 In Hanoi and Hoi An, we choose fine comfortable well-located hotels of a three or four-star standard. 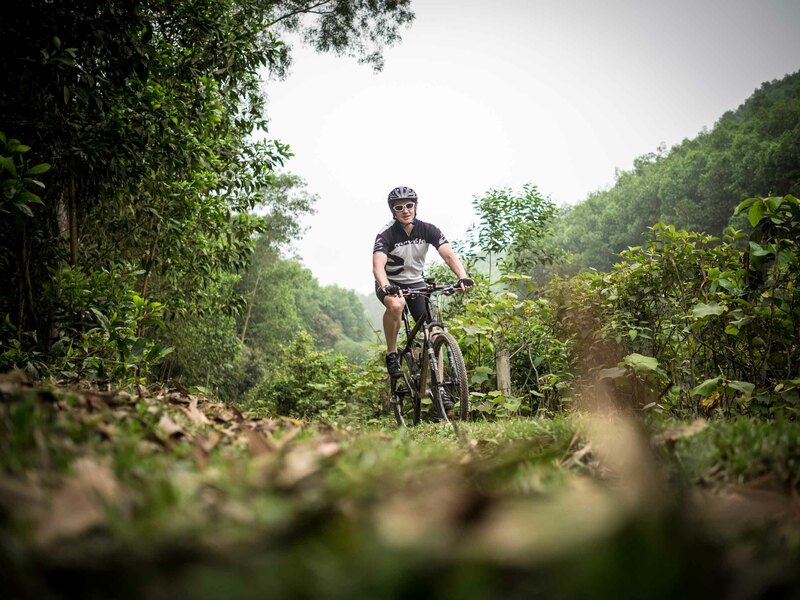 Elsewhere along the route, we use the best accommodation available that, although at times basic, feature air-conditioned ensuite rooms with hot showers and wifi. 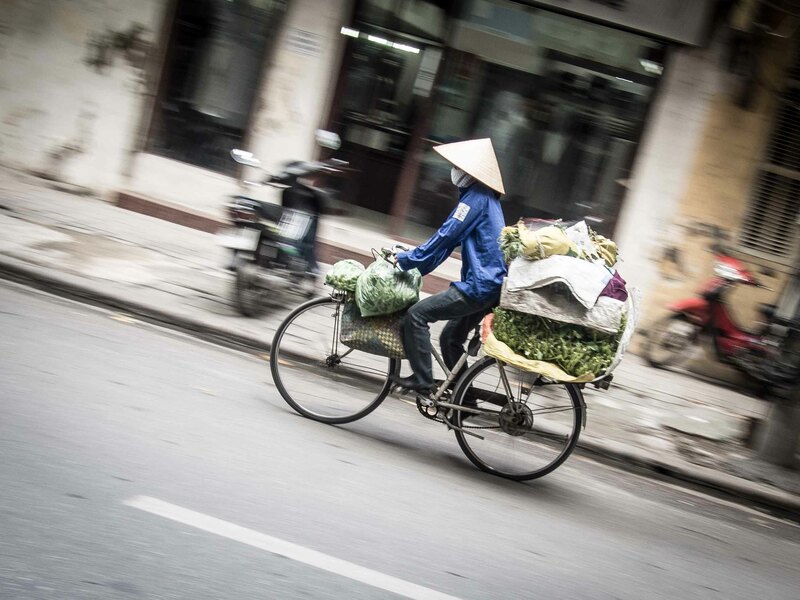 On arrival at Hanoi’s International Airport, you will be met and transferred to our hotel in Hanoi’s Old Quarter. 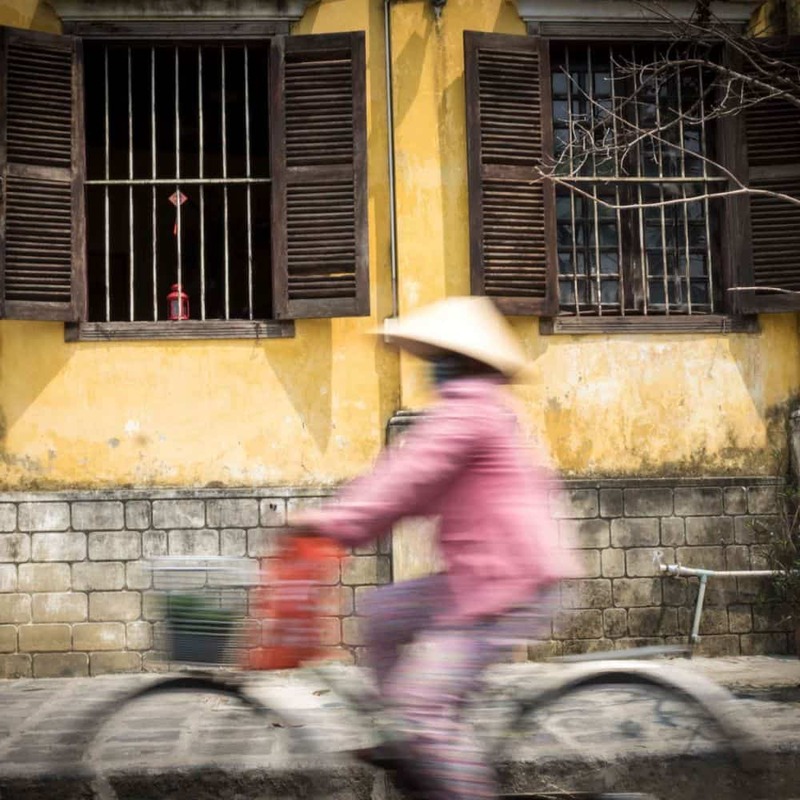 In this maze of narrow streets winding through crumbling colonial architecture the drama of daily life is played out for all to see, Hanoi’s Old Quarter is a fascinating place to spend time wandering and soaking up the vibrant atmosphere. 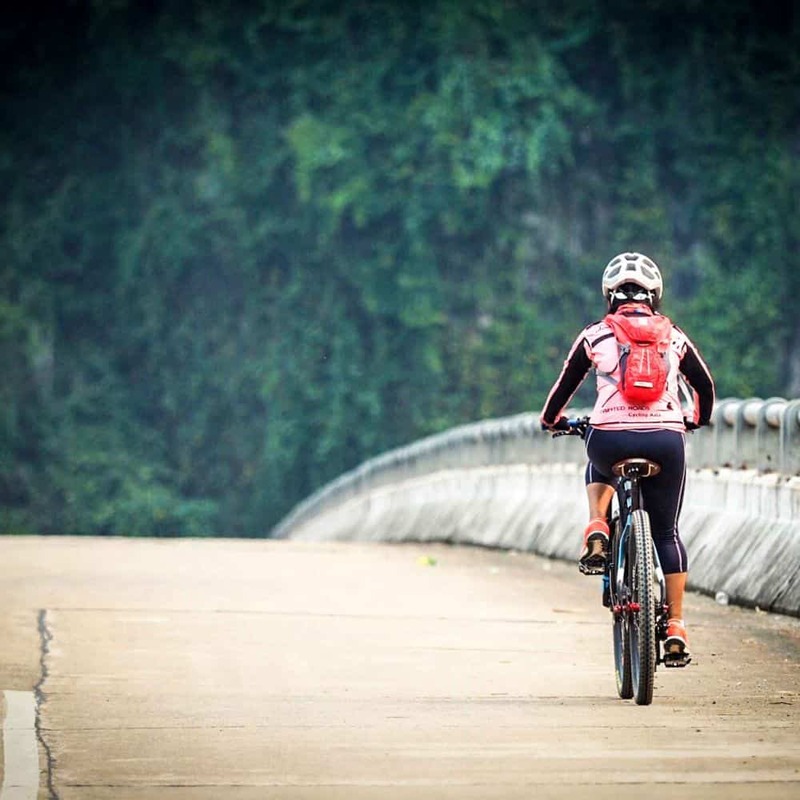 Today we must also make sure all is well with our bikes, whether you build up your own bicycle or become acquainted with your rental bike. 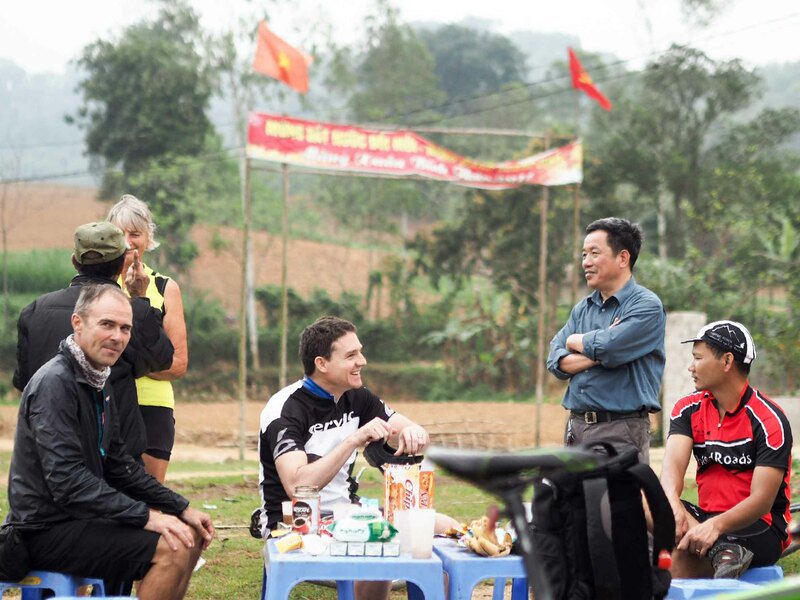 This evening we will meet for a tour briefing and enjoy our first meal together. 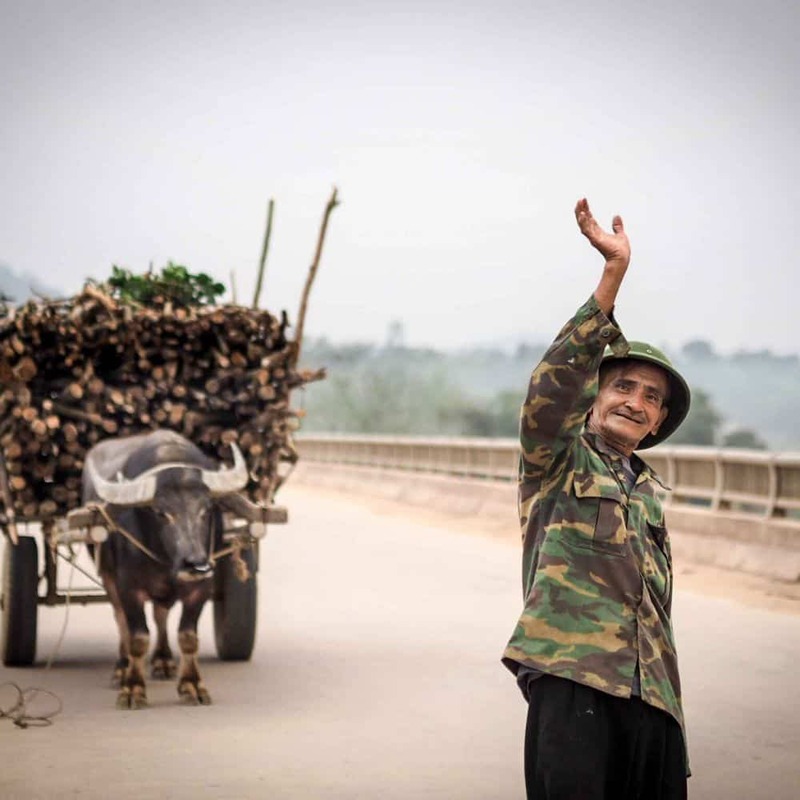 This morning we leave the teeming streets and bustle behind as we transfer by bus to the soothing calm of rural Vietnam. 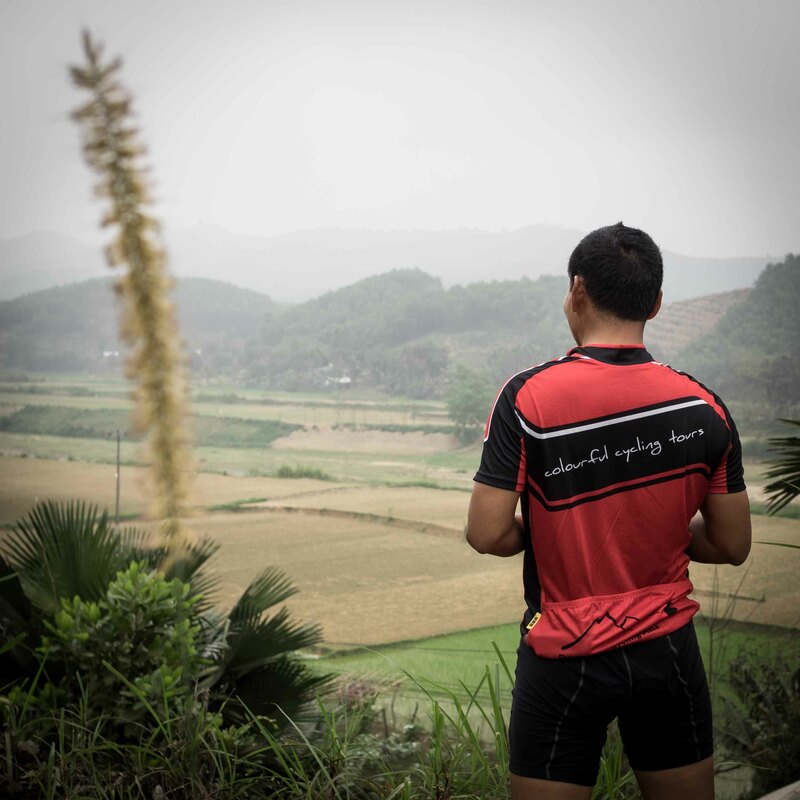 By the time we stop for lunch, we are in the countryside. 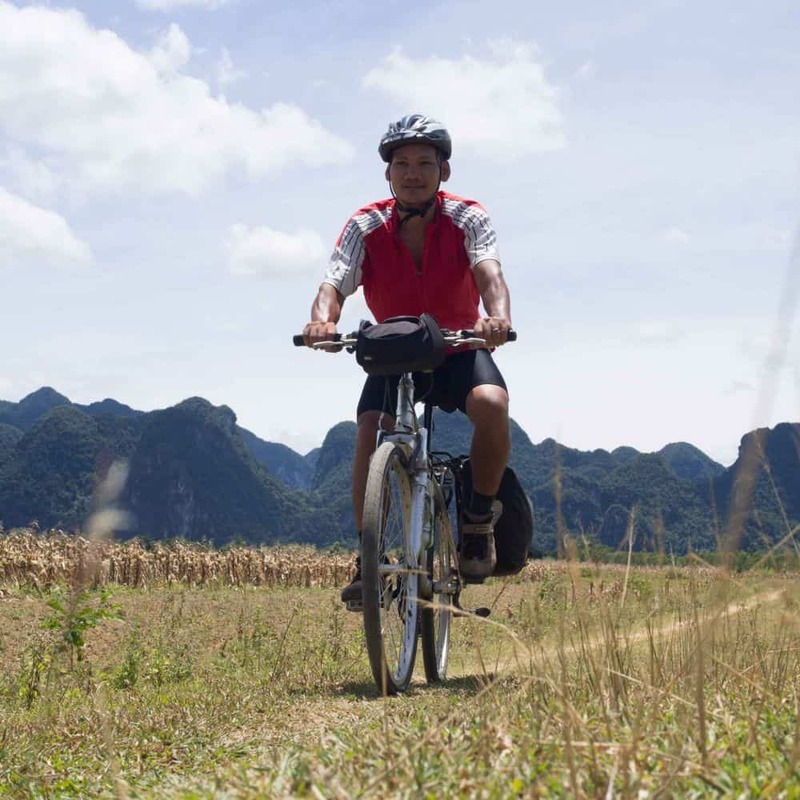 After lunch, our journey truly begins by cycling along a single lane road winding through rice fields towards the Black River where karst hills like those from a fantasy land jut dramatically skyward from its waters. 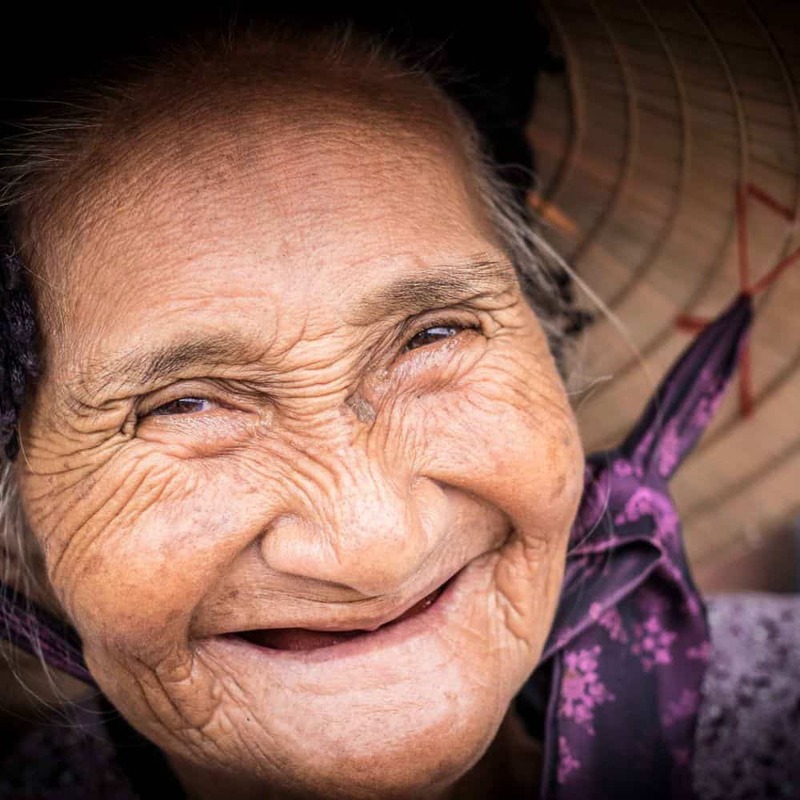 Thai minority people live here and their welcoming words are never far away as they warmly great we strangers passing by their homes. 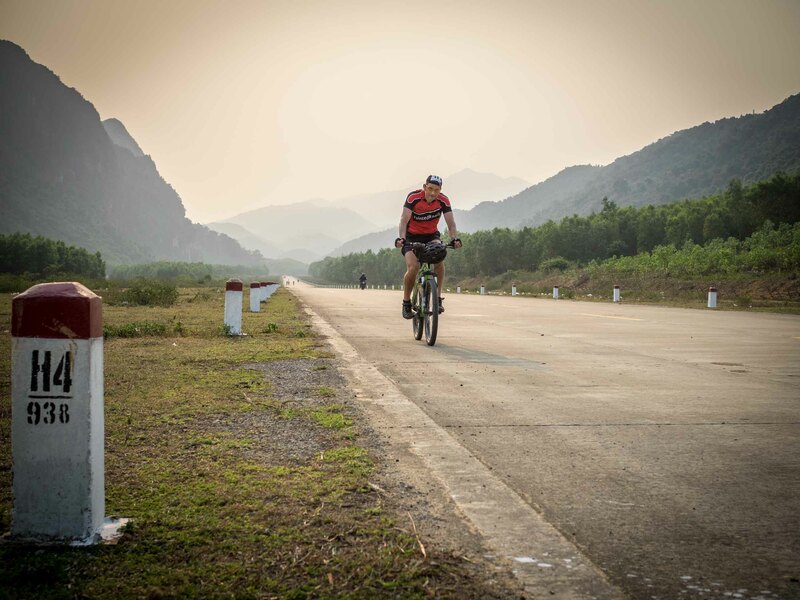 As we descend along a quiet track one can be forgiven for wondering if we have been transported to the dramatic scenery of Ha Long Bay. 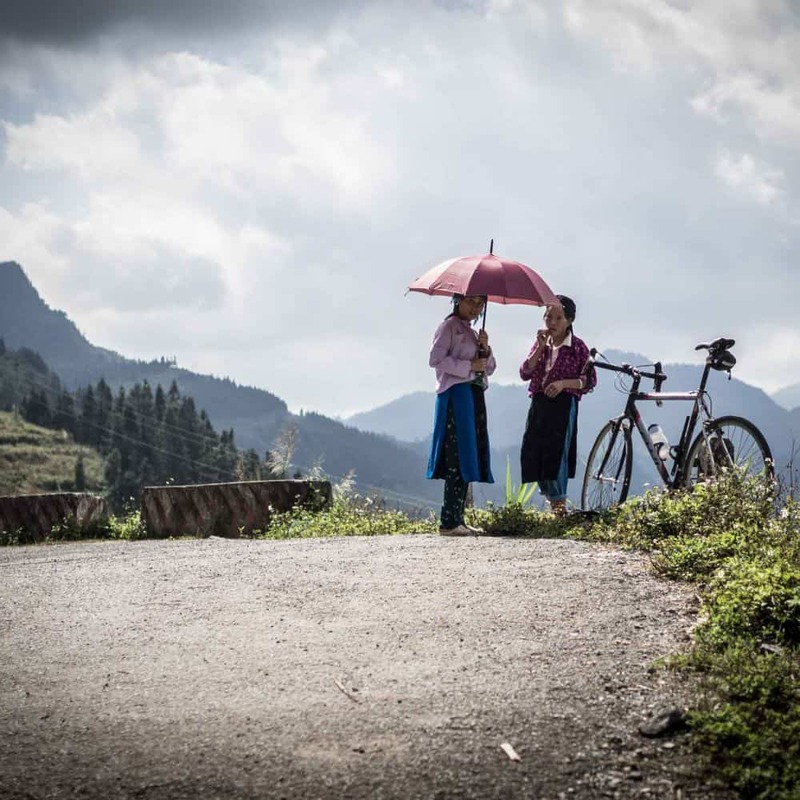 Set in a valley of rice fields Mai Chau is home to the Thai minority people. 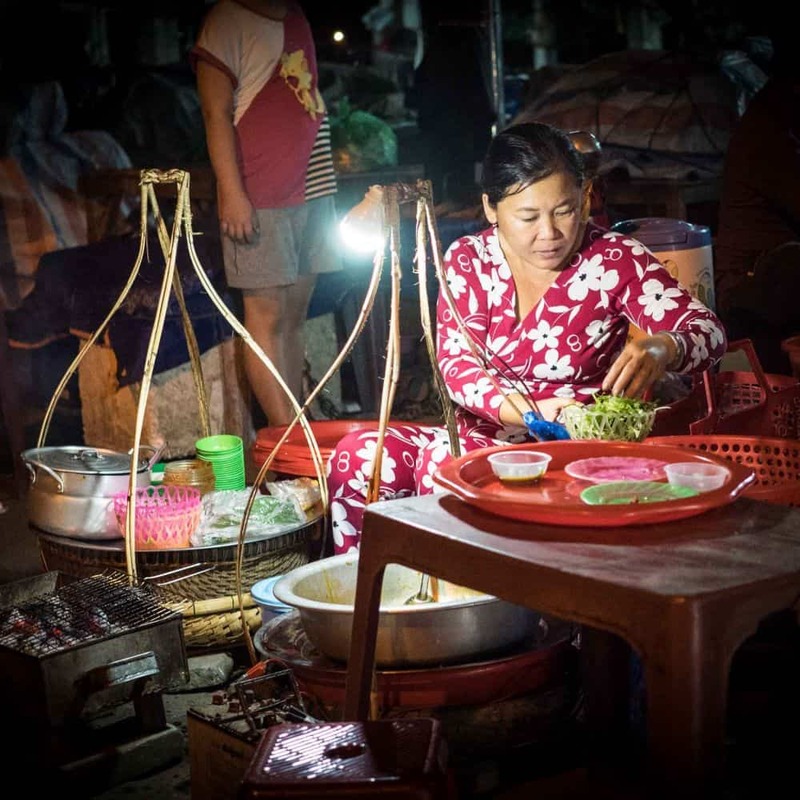 Here we get a real feel for rural life as we stay with a home-stay family in traditional wooden buildings on stilts. 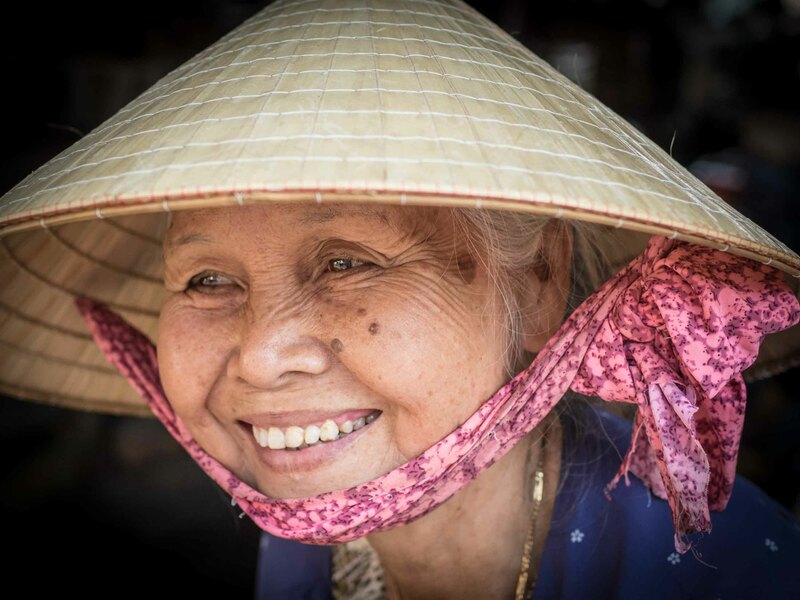 We arrive in time for a wander around the village or a ride through the rice fields before a fantastic evening meal. 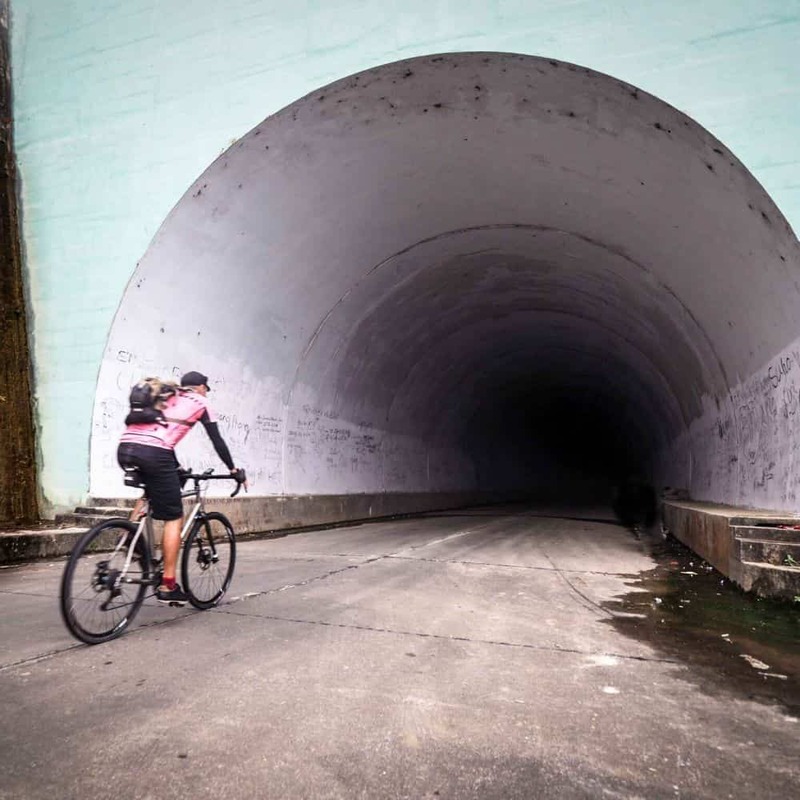 New for 2018 this loop ride is just too good to not include in this tour. 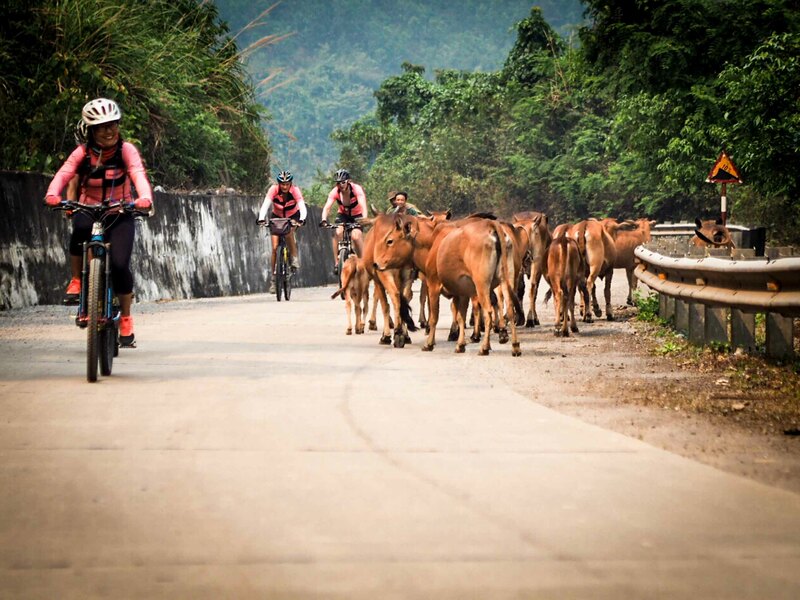 Virtually traffic free lanes lead us on a panoramic exploration of a pastoral valley rich in agricultural, rural culture, and breathtaking vistas. 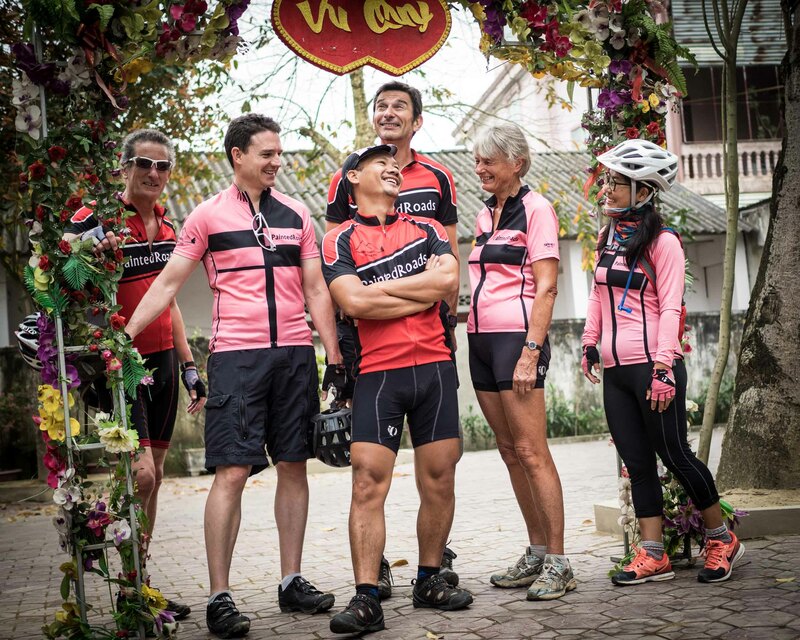 That the day’s ride ends at the delightful guesthouse from where we began our day's ride is the icing on the cake. 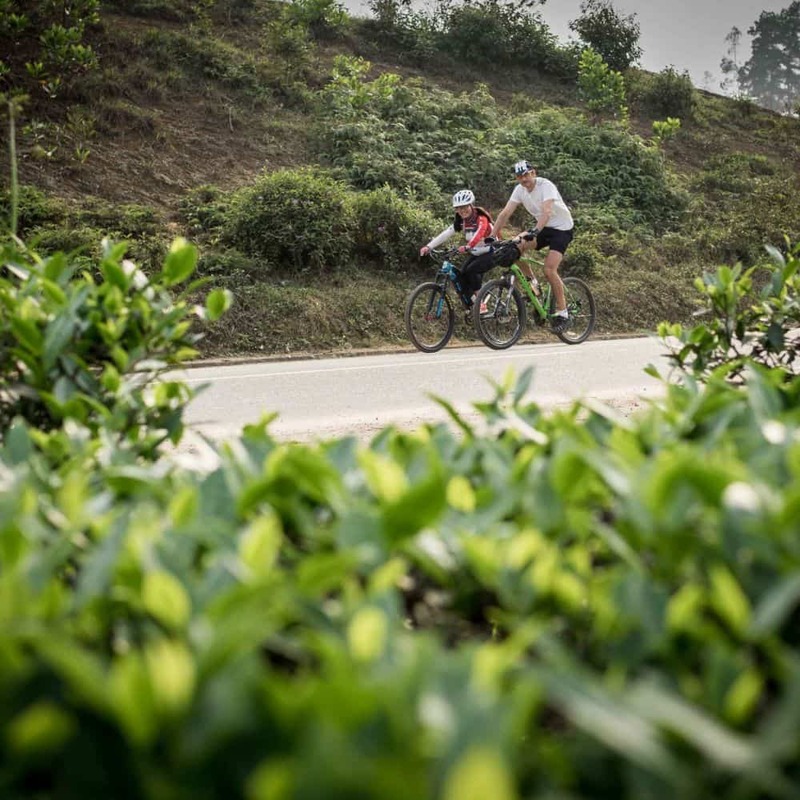 A short ride through rice fields and along the brown water of the Horse River leads us this morning to a fifteen-kilometre climb through hills vegetated with the bamboo forests that are so important to the livelihood of local people. 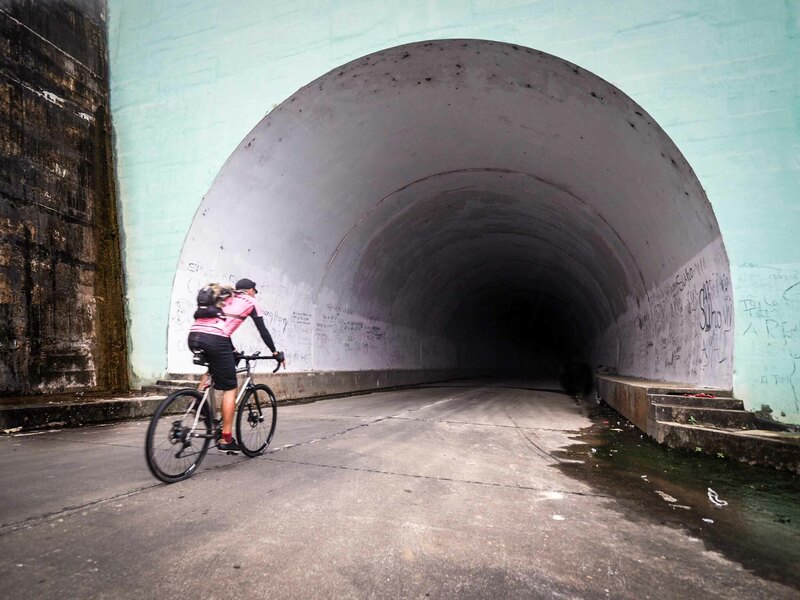 The climb is gentle, the road is all but traffic free, and silence hangs across the forest. 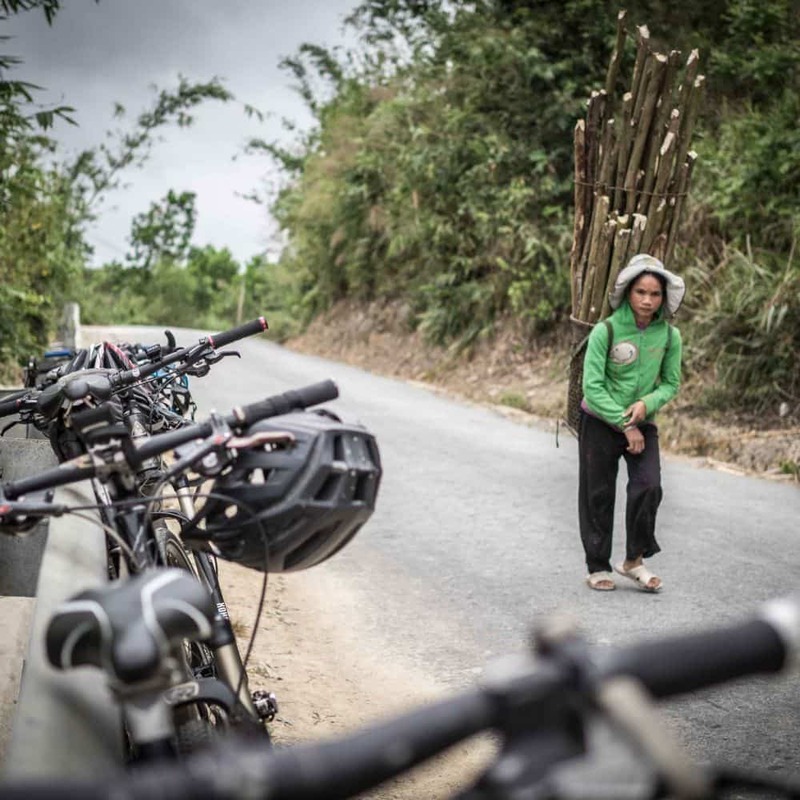 A twenty-five kilometre downhill leads us to lunch, after which we follow a small undulating country road through crops of sugar cane and rice before reaching our hotel for the night. 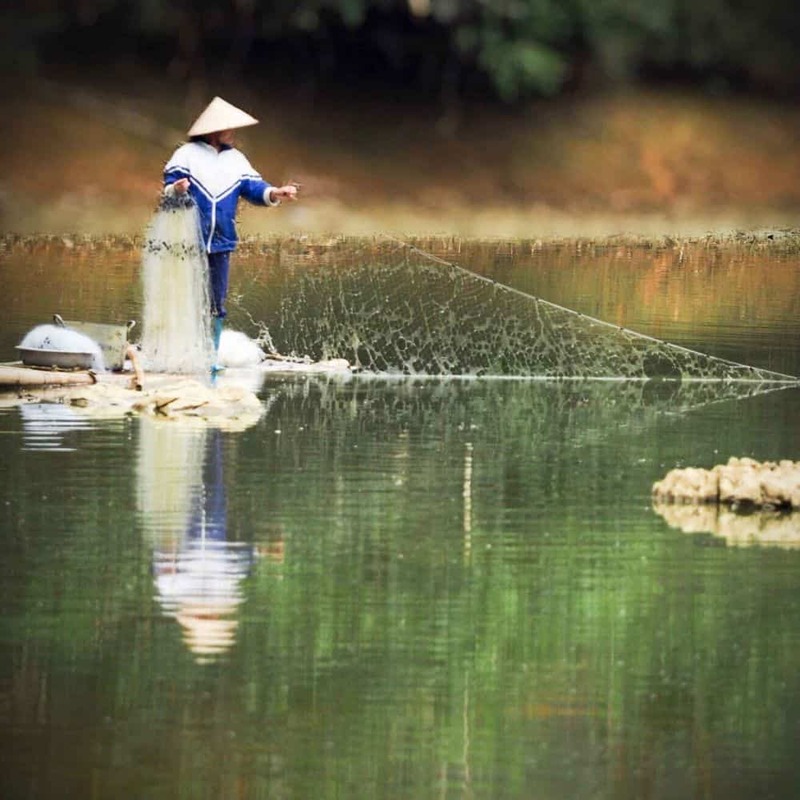 PaintedRoads tours are fundamentally designed as point to point tours. 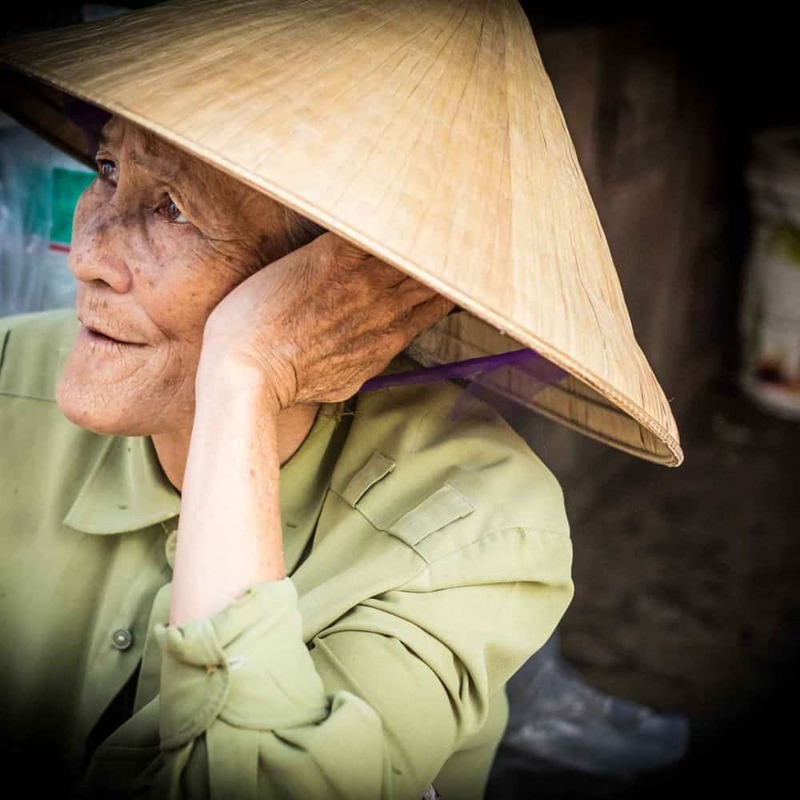 However there are times when a transfer simply makes too much sense to avoid, and so it is with this stretch of the Ho Chi Minh Trail tour where two hours in a minibus skips two days of traffic that, whilst not unbearable, is best avoided. 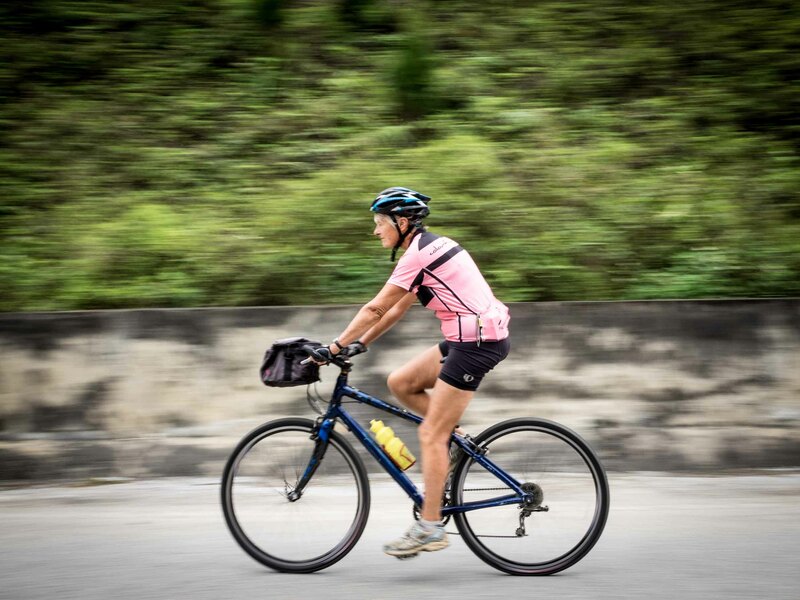 And so it is that following an early start we will begin cycling after our first break. 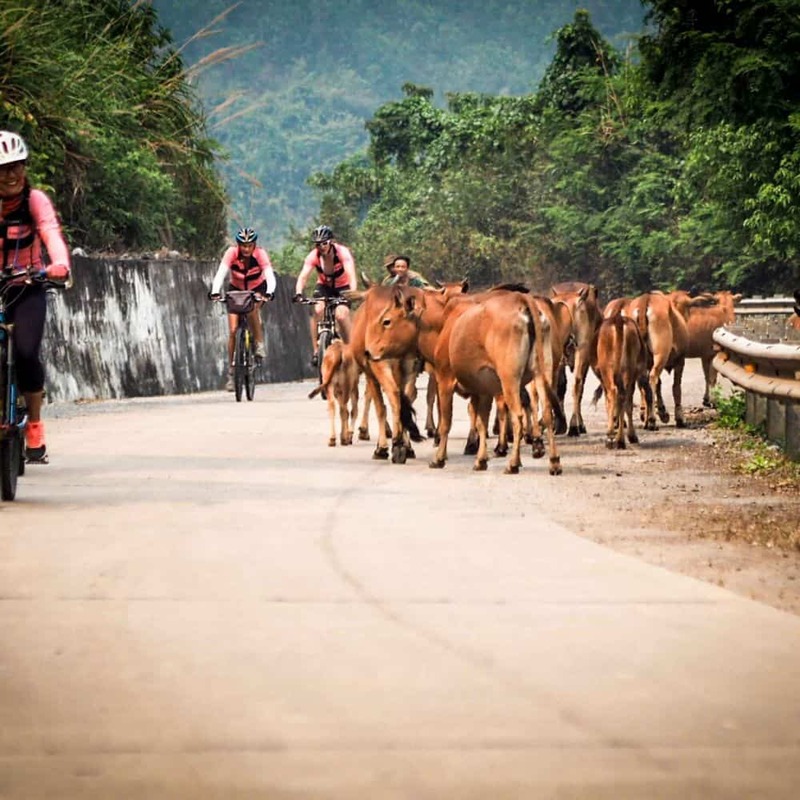 From here the nature of the route takes on an air of rural tranquillity wandering gently with small rises and drops generally of no more than 40 metres at a time. 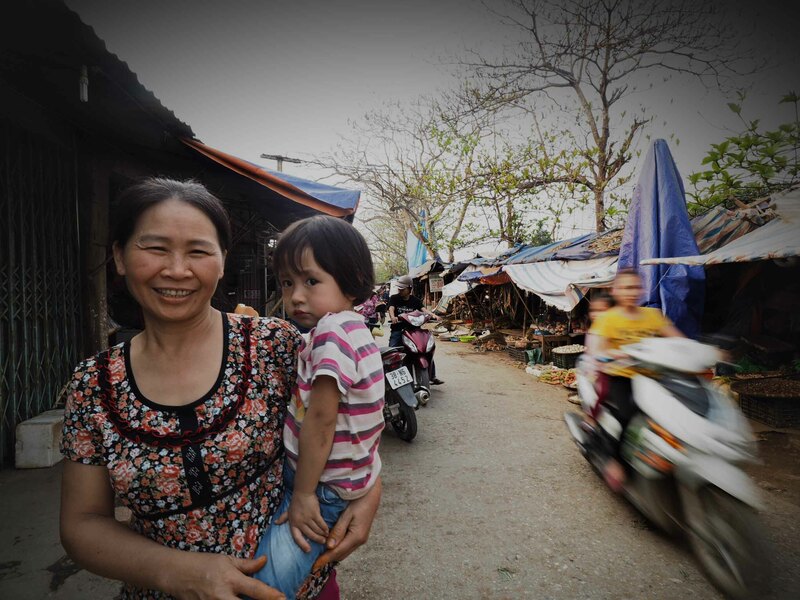 The views are lovely, the locals are welcoming, and all is well with the world. Transfer to the first break. 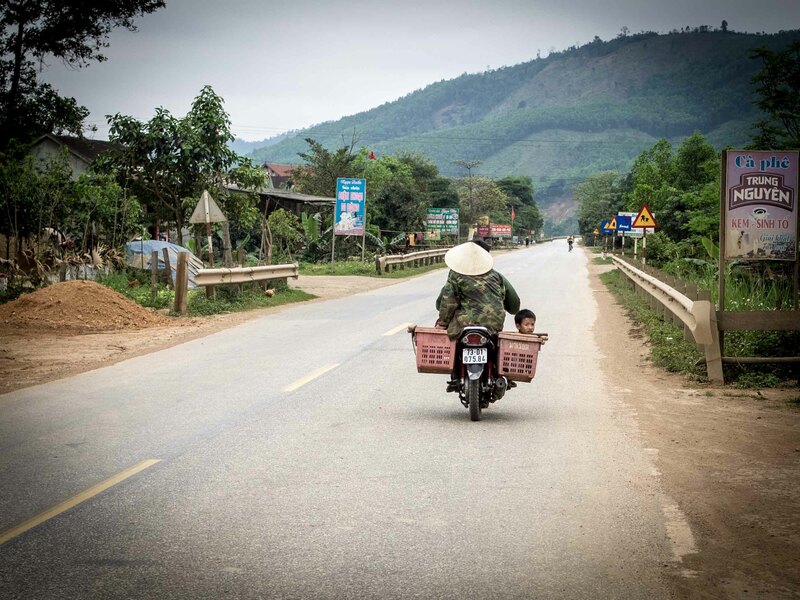 Heading ever closer to the Annamite Mountain Range that forms the formidable border with Lao we undulate along to lunch. 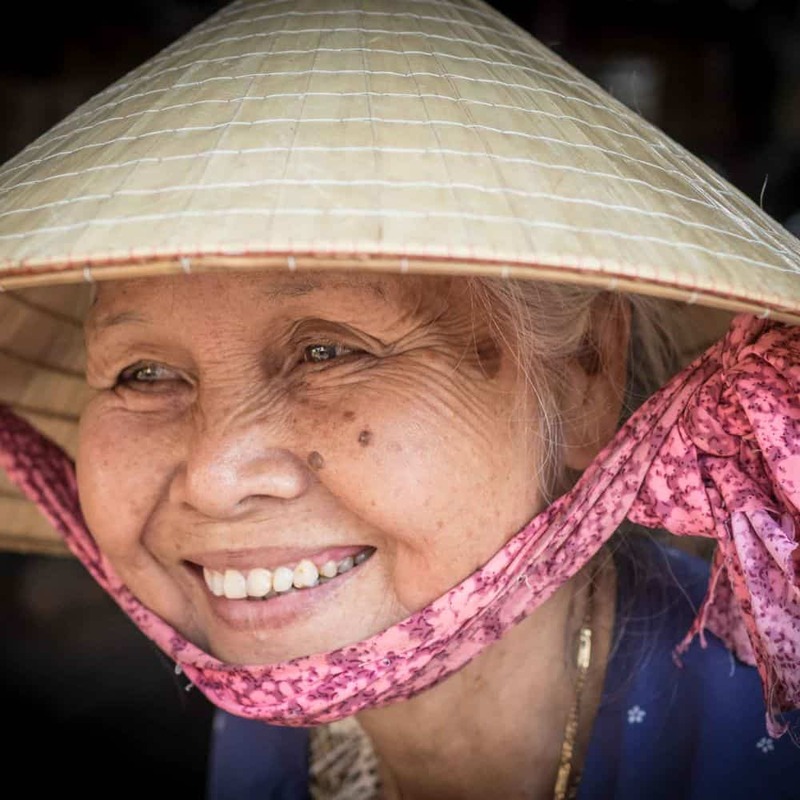 The afternoon begins with a relaxed twenty kilometres winding through small villages on a narrow rural road where we pass farm workers tending buffalo and working the rice fields. 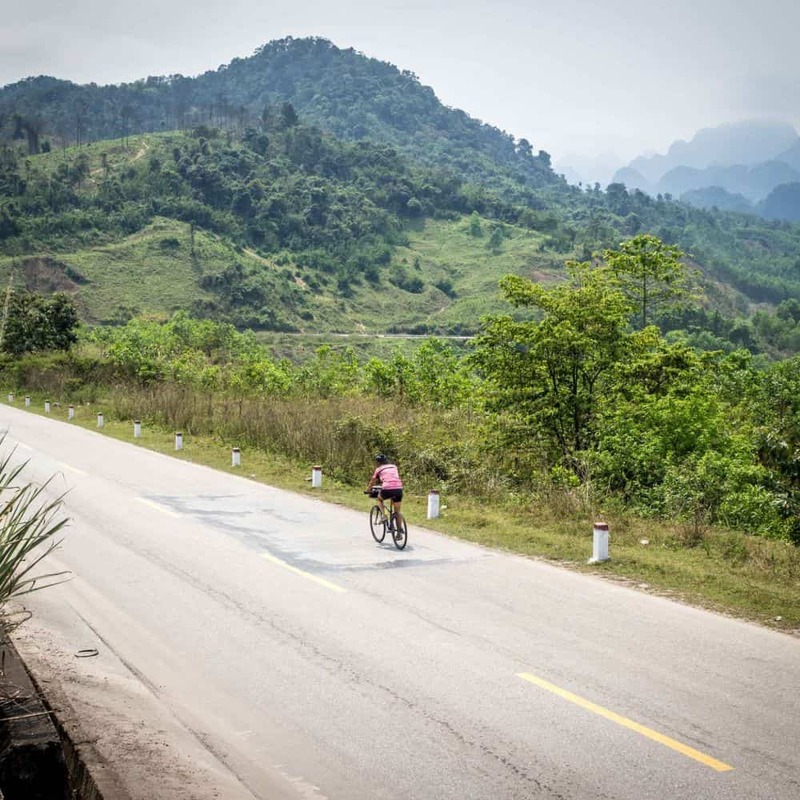 Rejoining the quiet Ho Chi Minh road we enjoy superb scenery as three minor climbs warm us up for days yet to come. 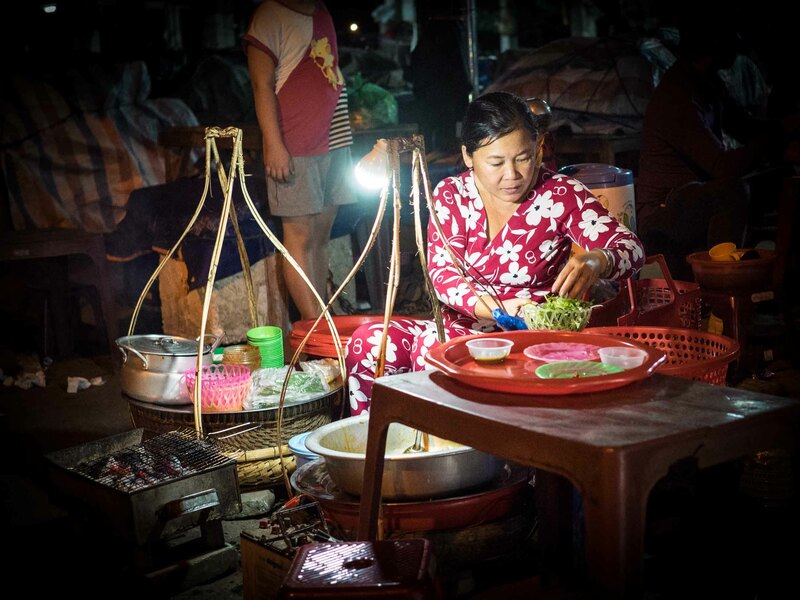 Our accommodation tonight is basic but affords such comforts as AC, internet and hot water, whilst giving us the chance to experience a small middle of nowhere Vietnamese town. 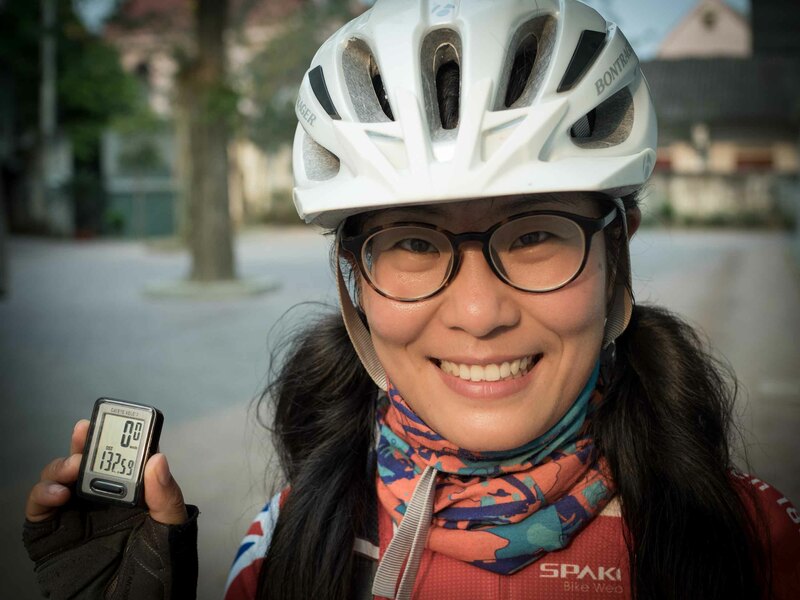 We now ride a stunningly beautiful road offering not only breathtaking vistas but also some incredibly rewarding cycling making today a day to remember. 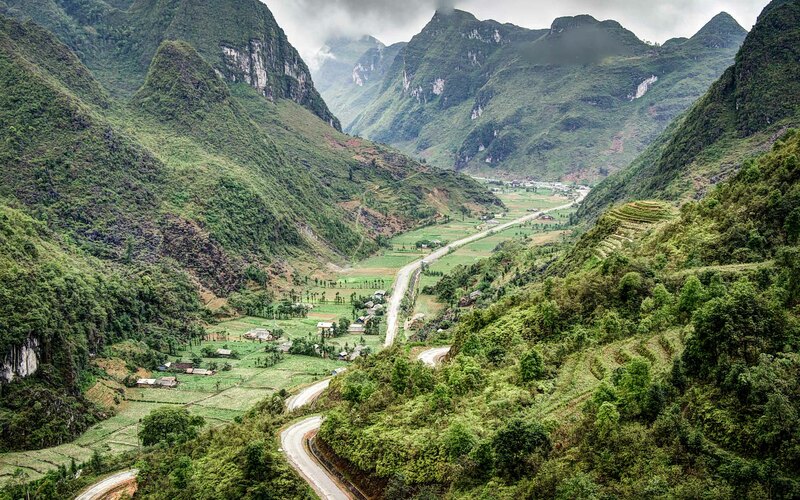 It is here that the Ho Chi Minh road winds its way up into the Truong Son Mountain range that separates Vietnam and Lao. 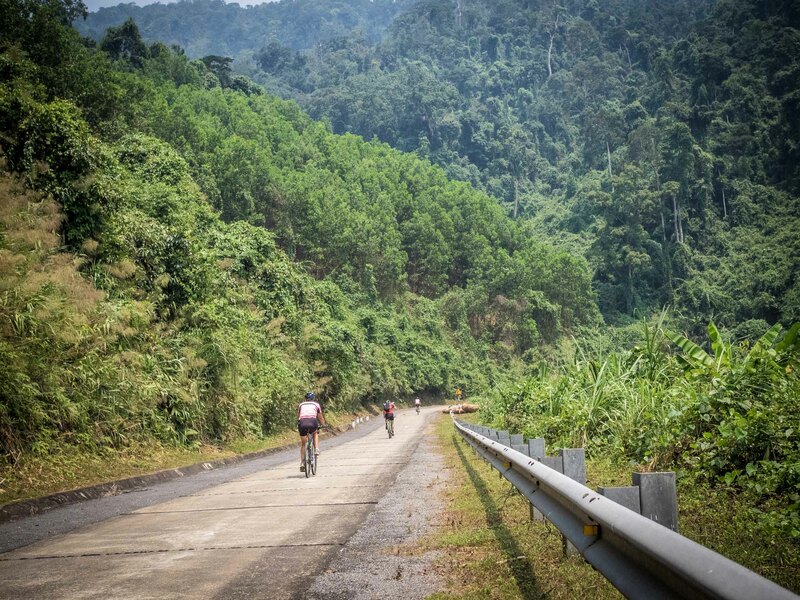 The hills are jagged limestone and clinging to these ancient wind and rain-worn spires are the triple canopies of virgin jungle through which our road rises and falls gently, providing a wonderful day’s cycling of satisfying climbs and gentle descents. 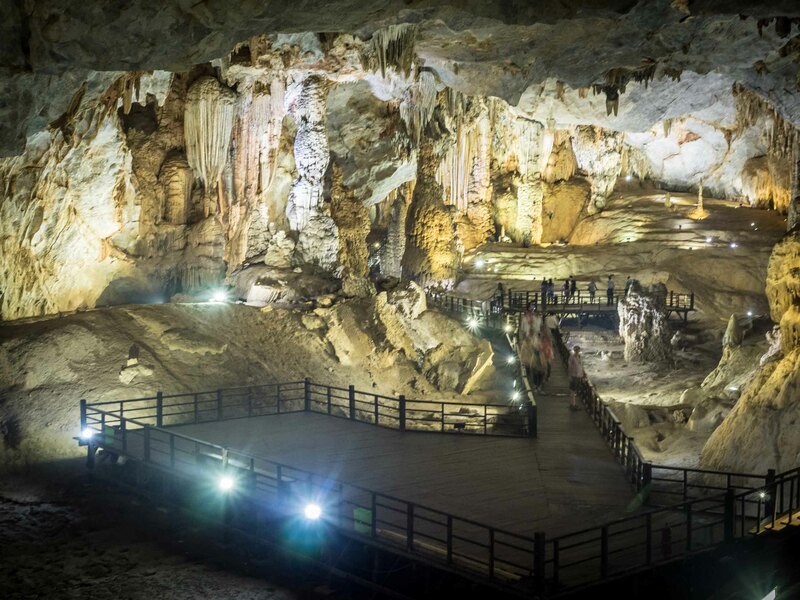 Phong Na is the small central town for the Phong Na National Park, the highlight of which are several impressive caves including the stunning Paradise Cave. 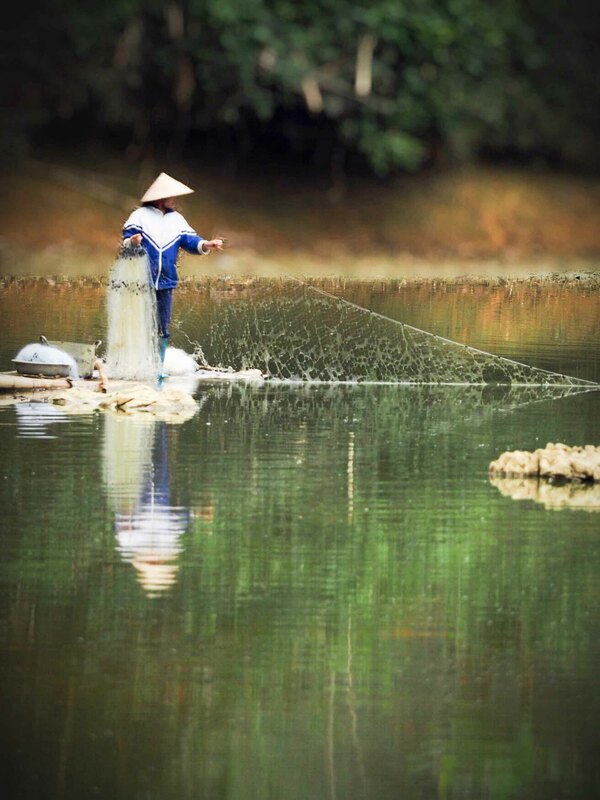 A morning trip to the caves is highly recommended followed by a relaxing lunch back in town and an afternoon relaxing on the terrace of our riverside resort. 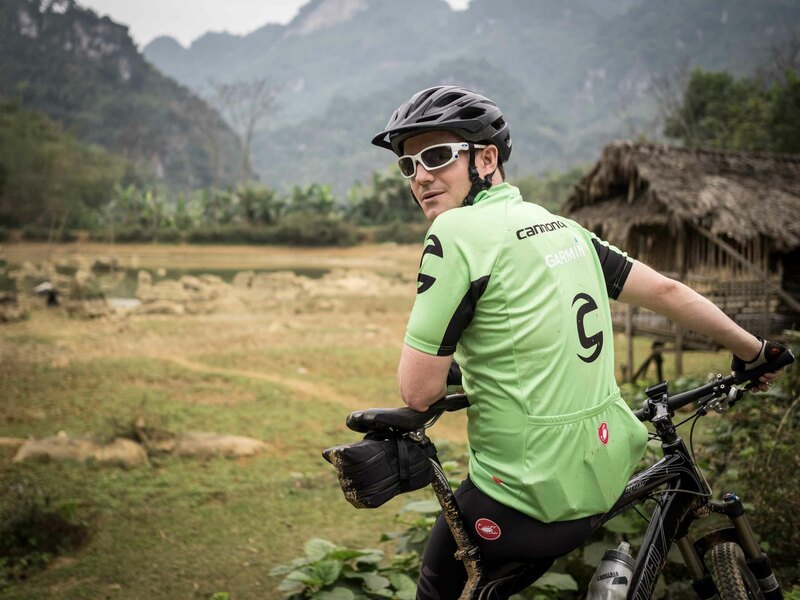 Having rested for a day the most challenging two days of the tour lay ahead. 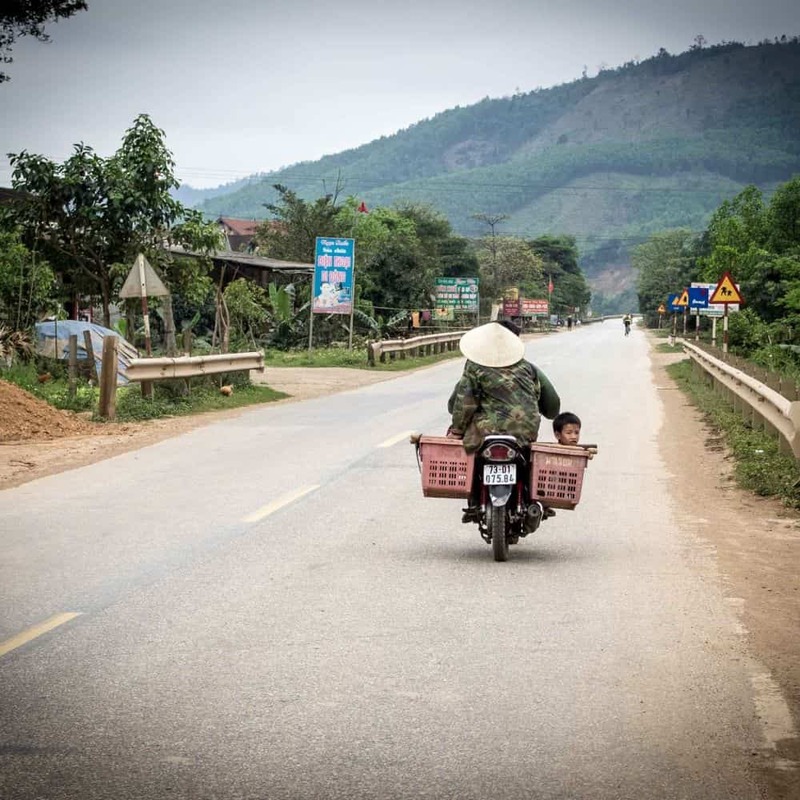 Leaving Phong Nha we take the road less travelled as we head into the wilderness on a little travelled but well-maintained road winding and undulating through the Troung Son mountains. 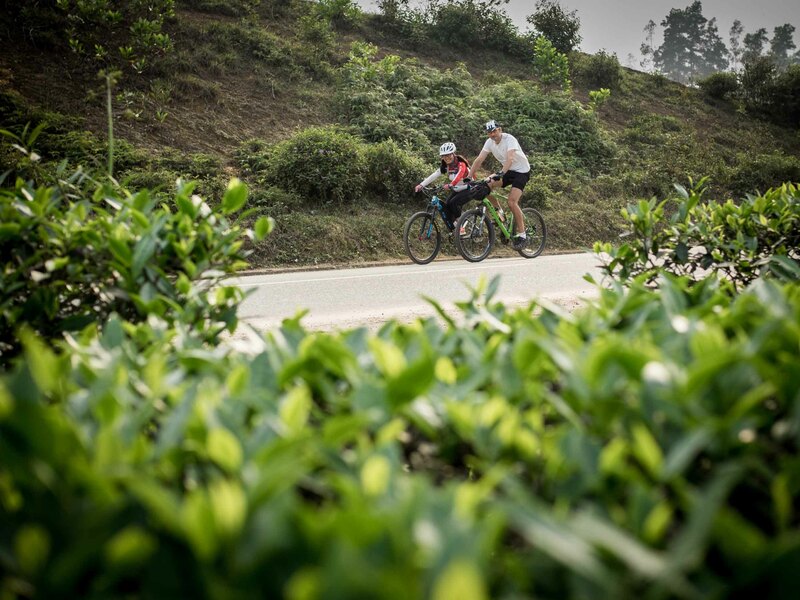 During the first forty kilometres, we have a pair of notable climbs that take us from sea level to 800 metres. 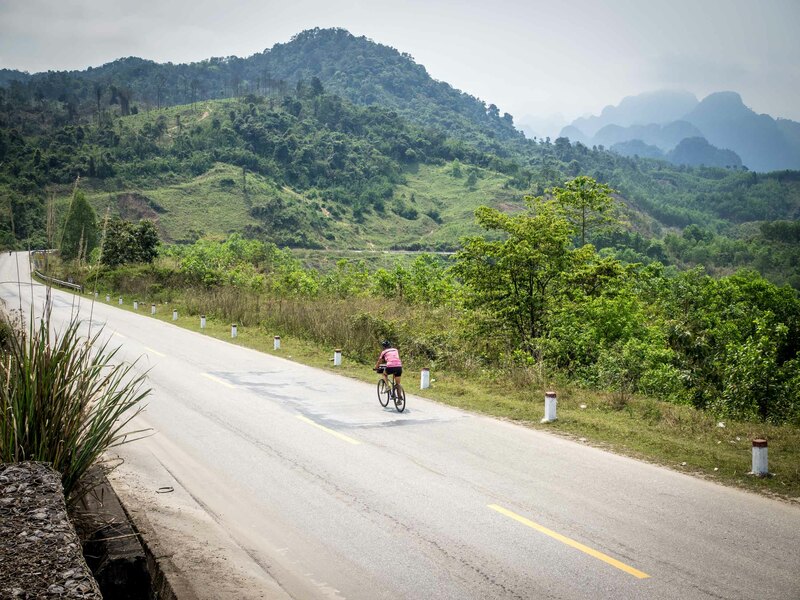 From here the reward begins as we descend through a tranquil scene following the border with neighbouring Laos. 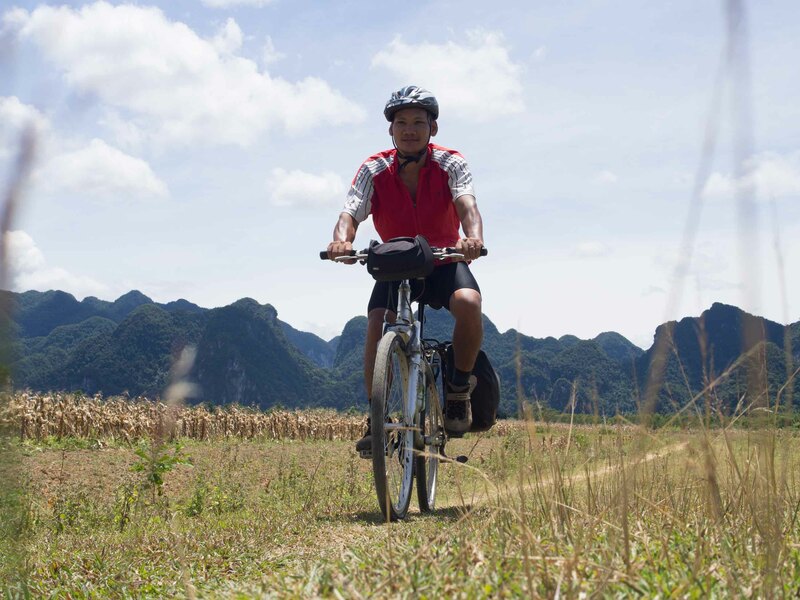 The cycling is quite wonderful, with empty roads rising and falling through a jungle-covered mountain wilderness. With barely a soul to be seen all day the soundtrack is that of the jungle - birds, monkeys and cicadas. 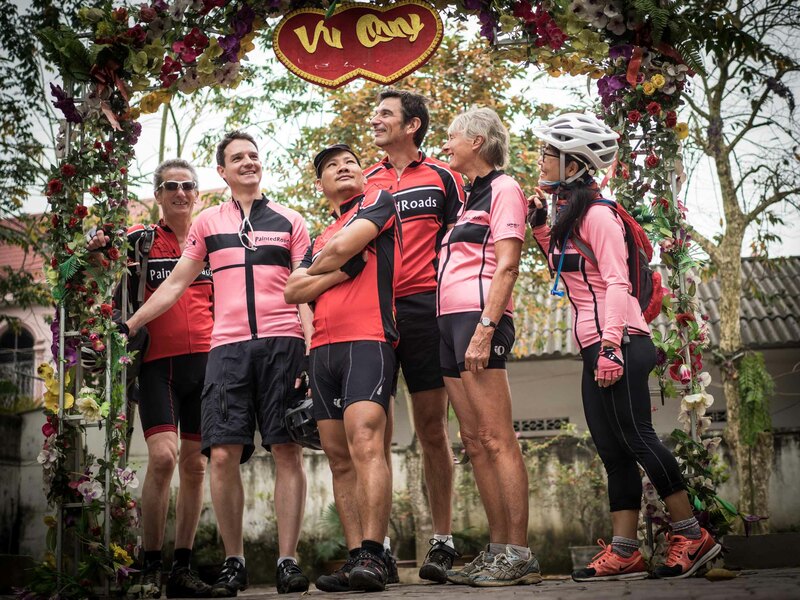 There is a big day ahead as we continue this remote ride through such a little-visited region of Vietnam. 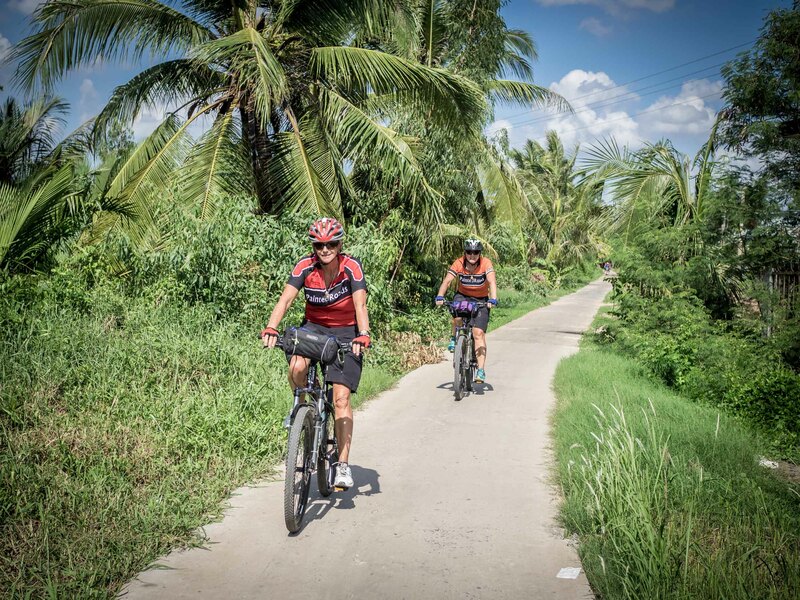 We wheel on today through beautiful scenes of tropical flora, following valleys and crossing passes. 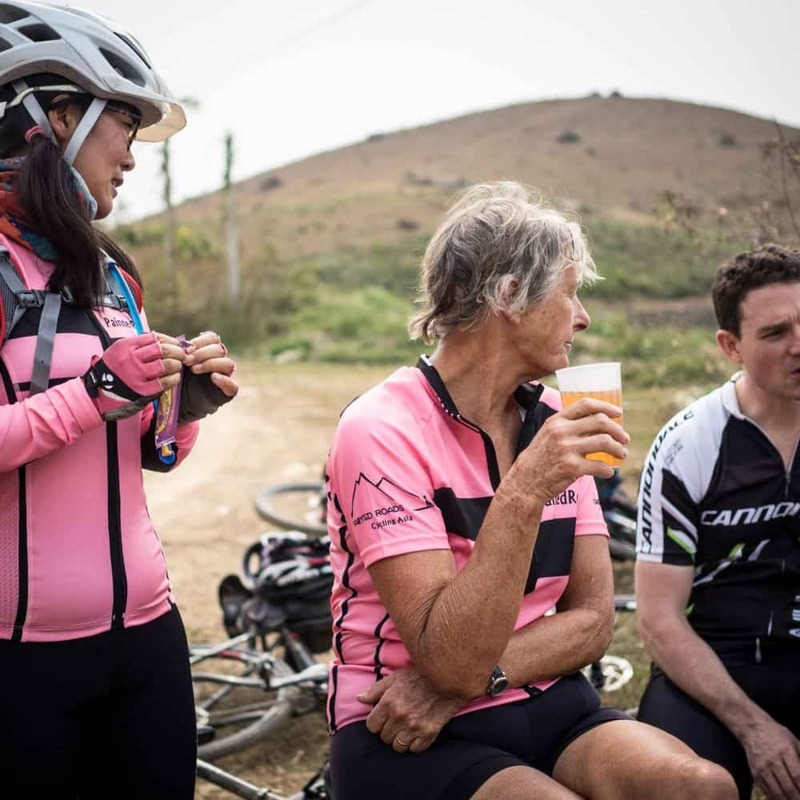 With 135 kilometres and 2 notable climbs – one to 800 metres and the next to over 1000 – today is a challenging day without a doubt and a spell in our AC support bus may be necessary. 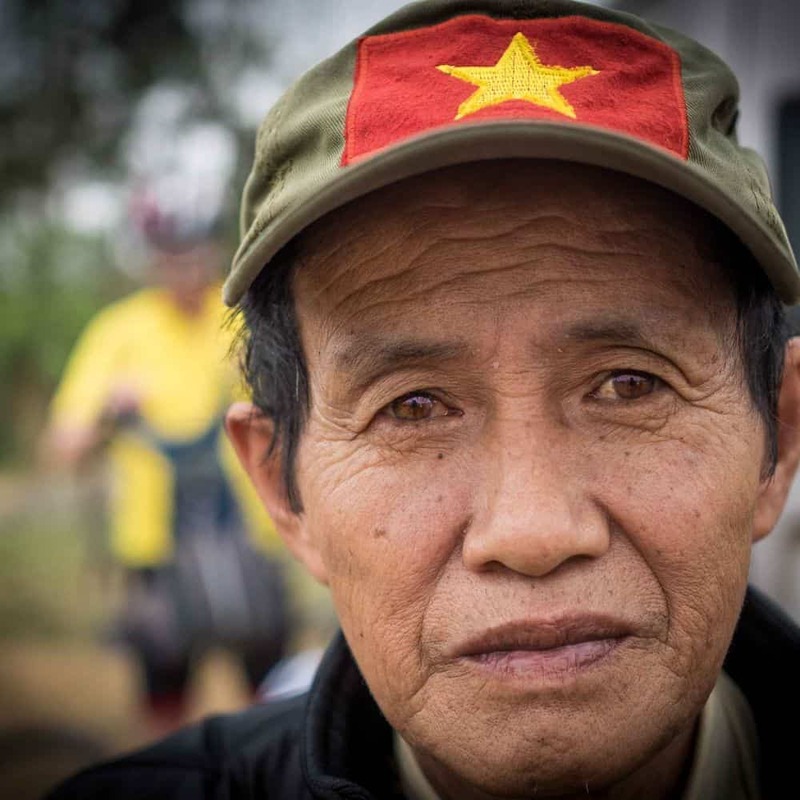 For those interested in the Vietnam war we cross the 17th Parallel where we can learn a little about the history here from our guide Phong. 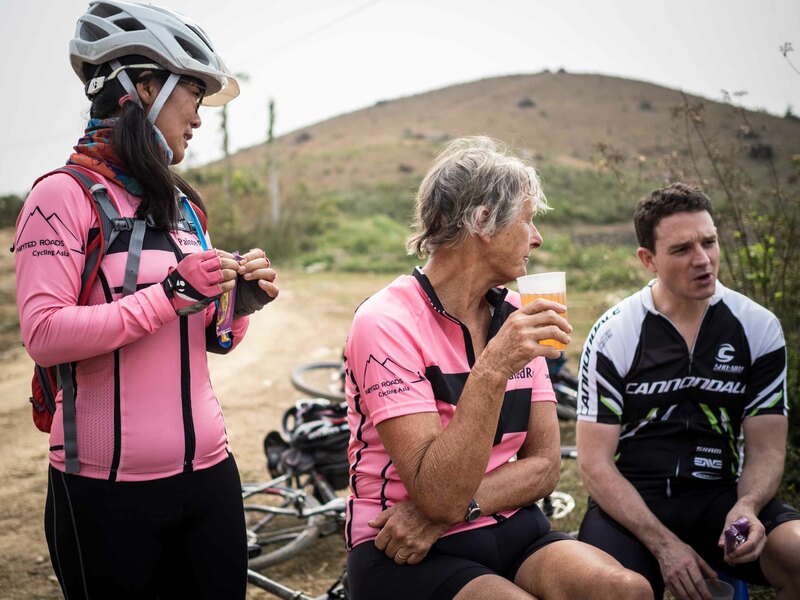 The day ends with a splendid ten kilometre downhill and an undulating ride through coffee plantations into the border town of Khe Sanh, where a much deserved cold beer awaits us at our hotel. 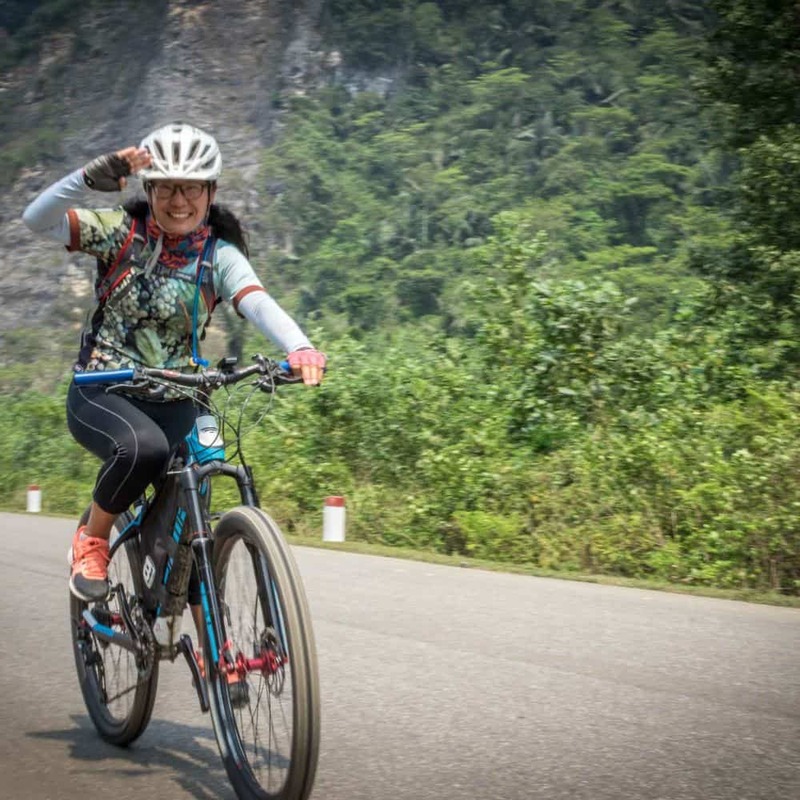 We begin a splendid day’s ride in fine style with a twelve kilometre downhill as we head east for a while before turning south again for a lovely undulating, swooping and winding ride through a beautiful valley. 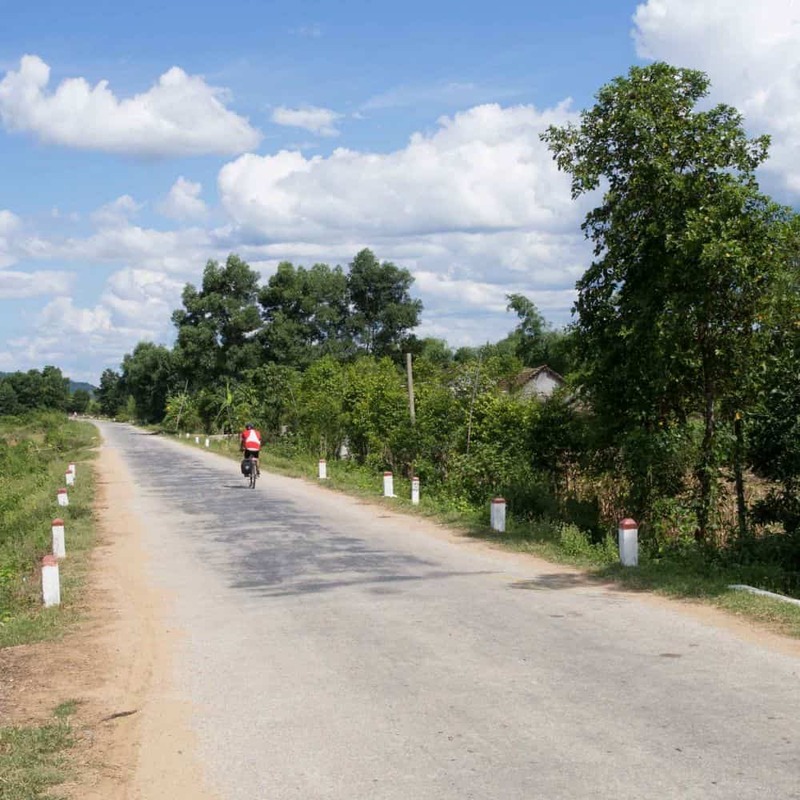 The gradients are excellent for cycling as we pass through small villages of wooden house reminiscent of rural Lao. 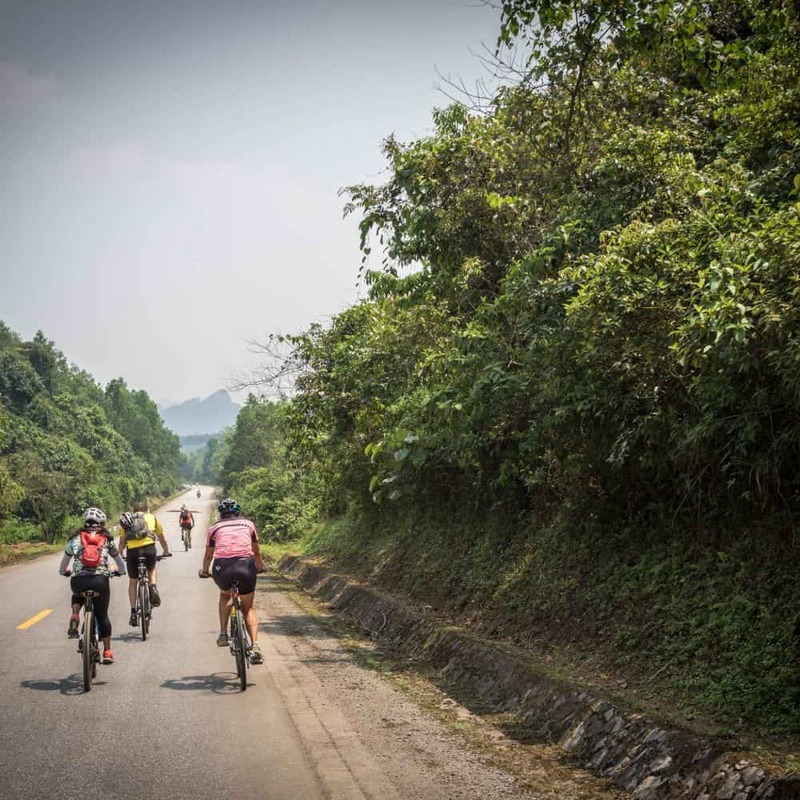 In the afternoon a six-kilometre climb leads us up and onto a fascinating plateau with beautiful views along which we have a gently undulating ride to the laid back town of A Luoi where we will rest and refresh for the night. 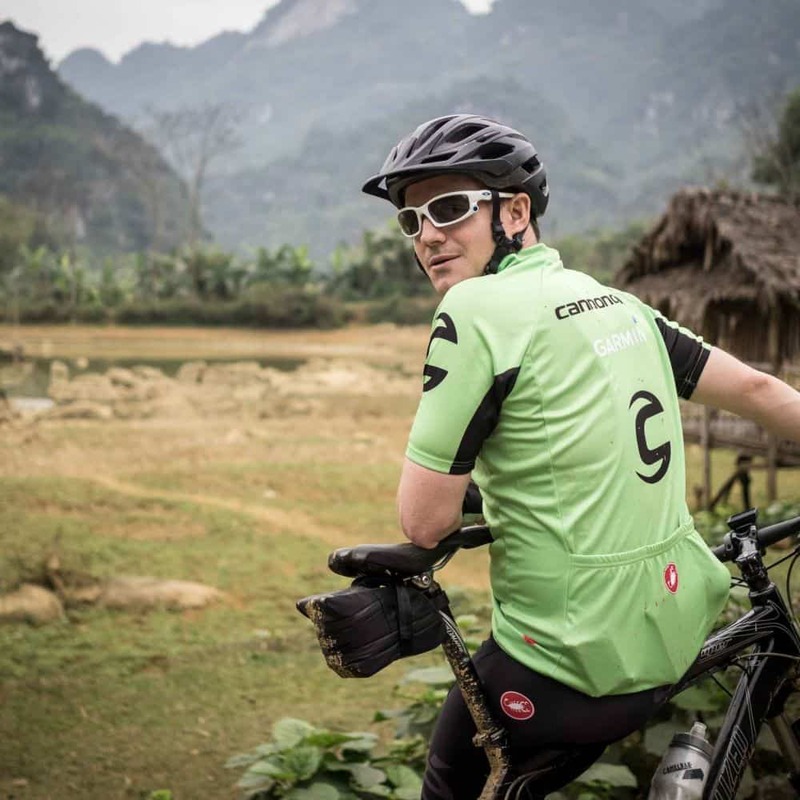 We continue along the plateau for the first hour or so this morning until a six-kilometre decent drops us into another lovely valley and onto the first of several climbs that leads to a quiet ridge that undulates and provides stunning views across jungle covered valleys as far east as the South China Sea. 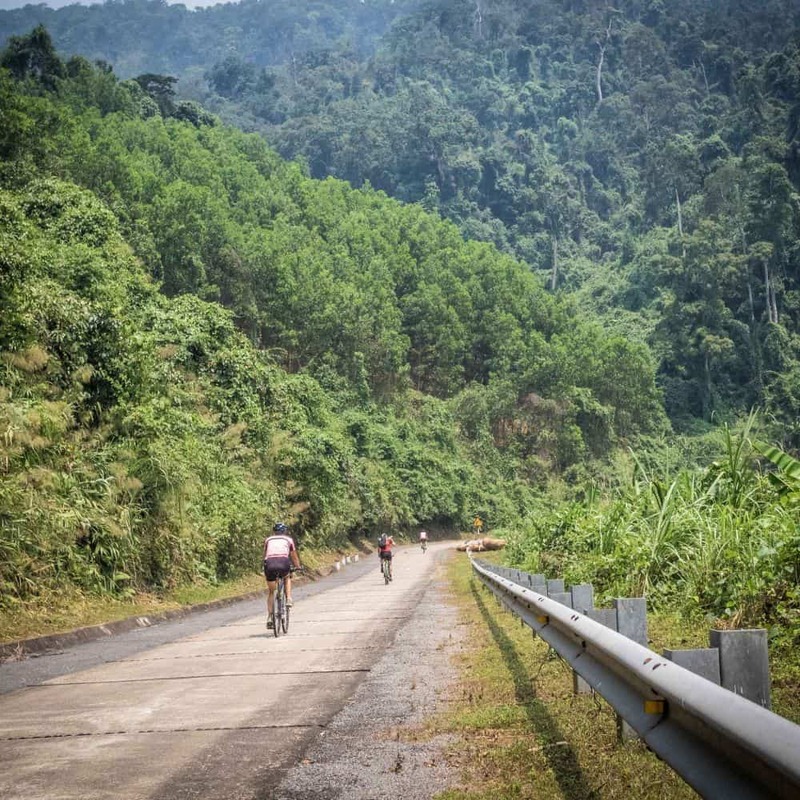 We finish the day with a downstream valley ride that throws in one or two little challenges in the shape of cheeky little climbs. 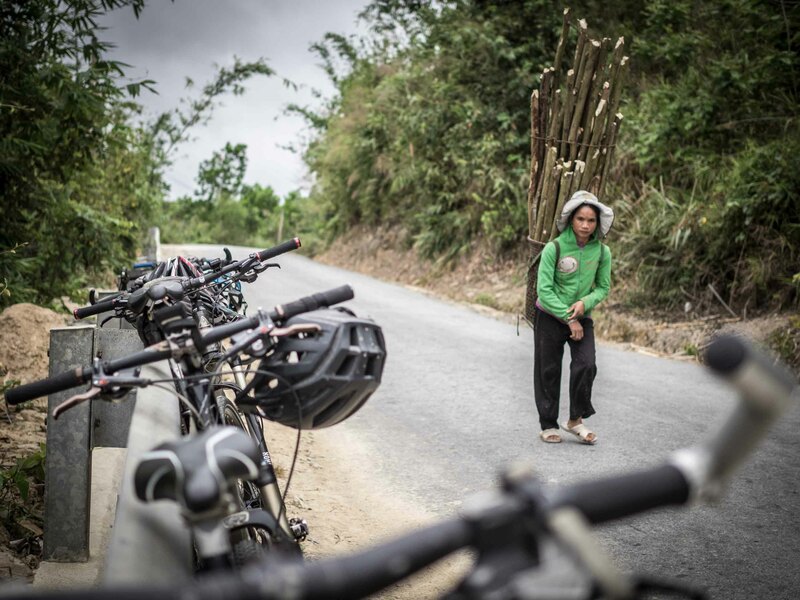 Our final day on the bikes follows a beautiful and gently undulating rural lane that leads us through the lovely Ba Na Nui Chua nature reserve. 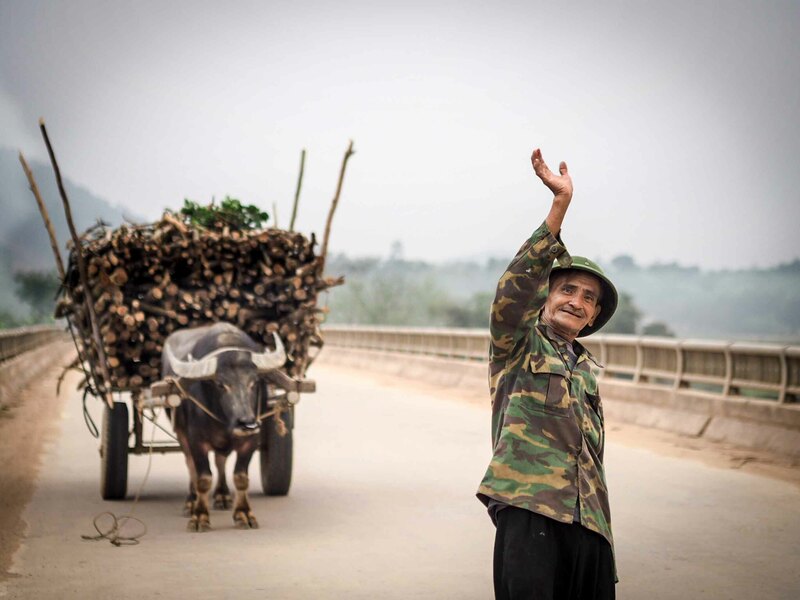 For the past ten days we have been passing through a variety of landscapes and here, as a fitting finale is something different again as we pass through beautiful evergreen forests. 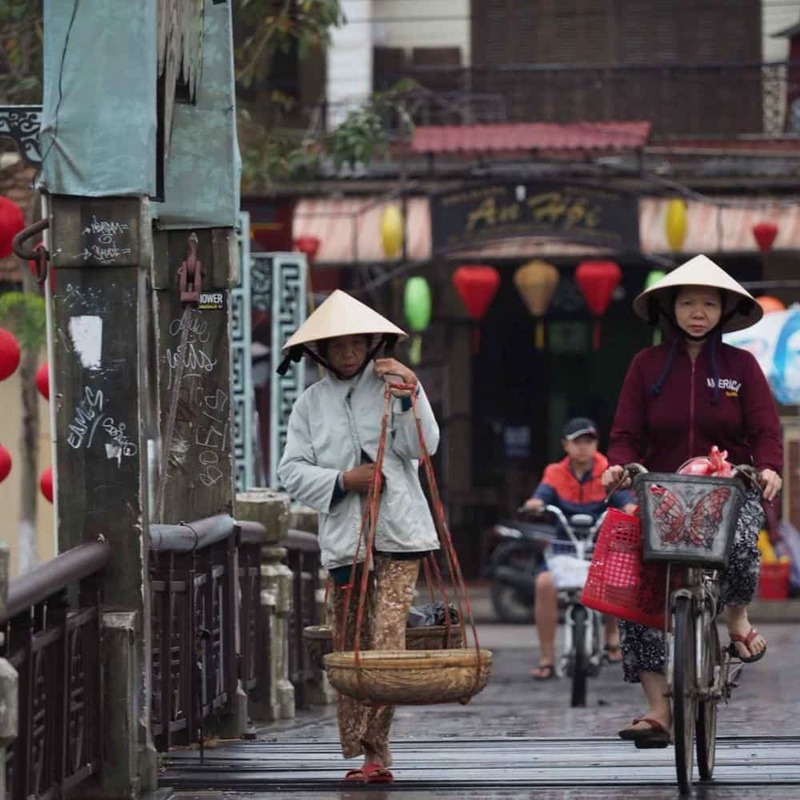 After lunch, we head towards the lovely little town of Hoi An with its preserved colonial architecture of crumbling pastel colours centred around the splendid promenade on the Thu Bon River, a delightful place to an exploration of a Vietnam seldom seen. 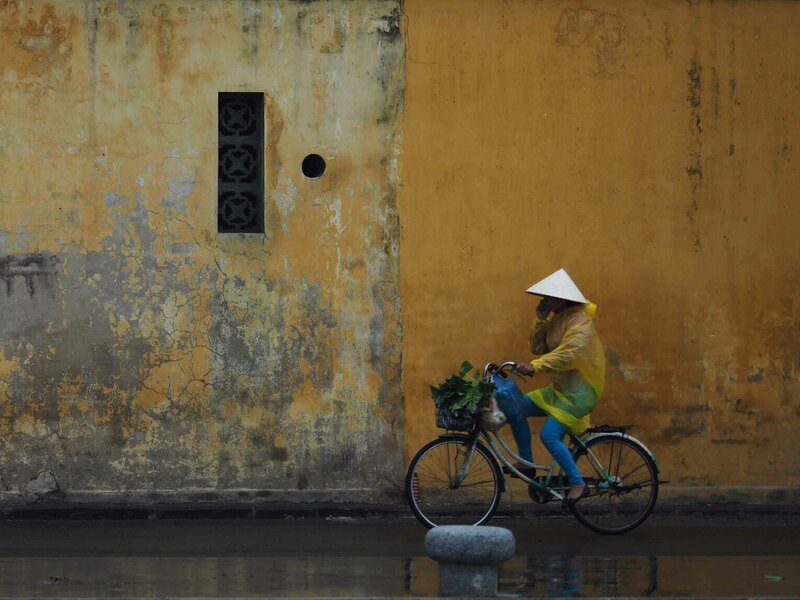 The tour officially ends this morning in Hoi An where there are many options for onward travel. 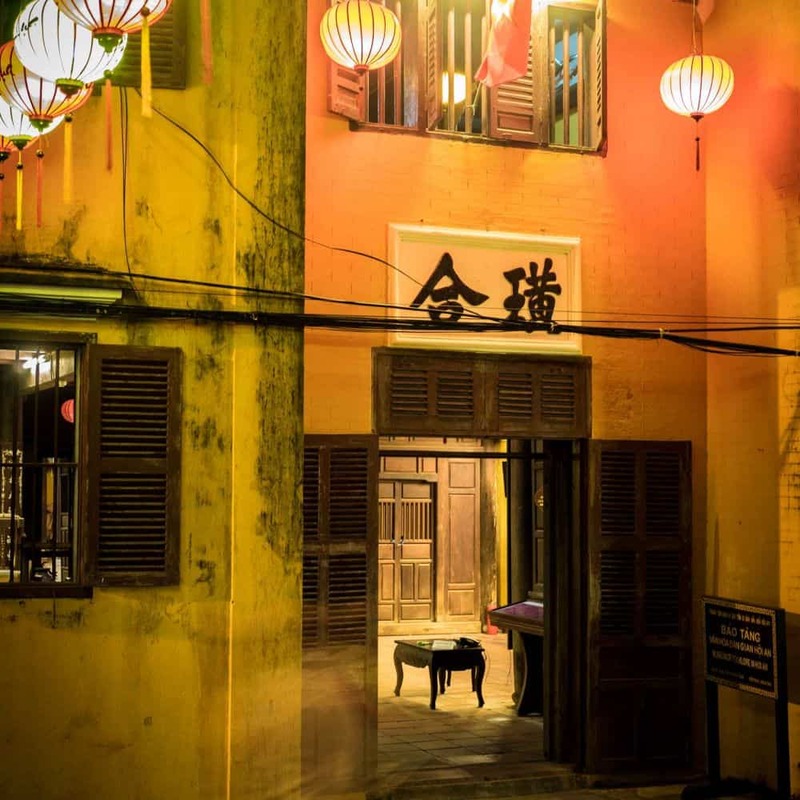 For those with time to spare a day or two wandering the lovely car-free streets of this delightfully preserved ancient trading town is worthwhile. 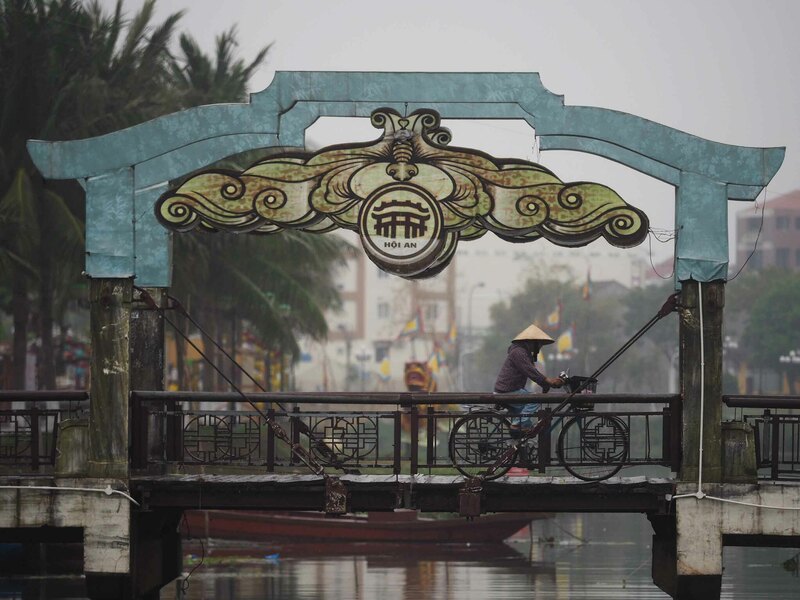 Nearby Da Nang has plenty of beach resorts for those wishing to see the sea. 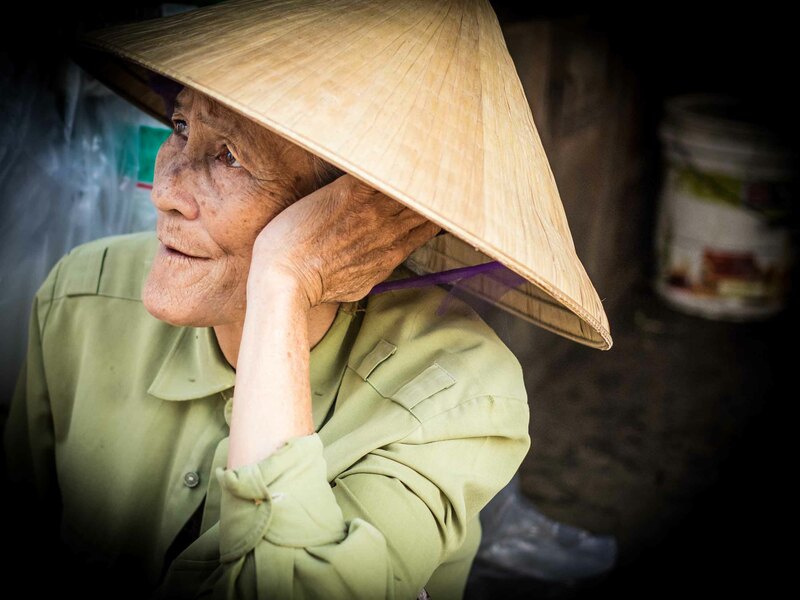 Should you be keen to explore more of Asia Da Nang Airport offers flights to Hanoi, Saigon, Ho Chi Minh City or further afield. 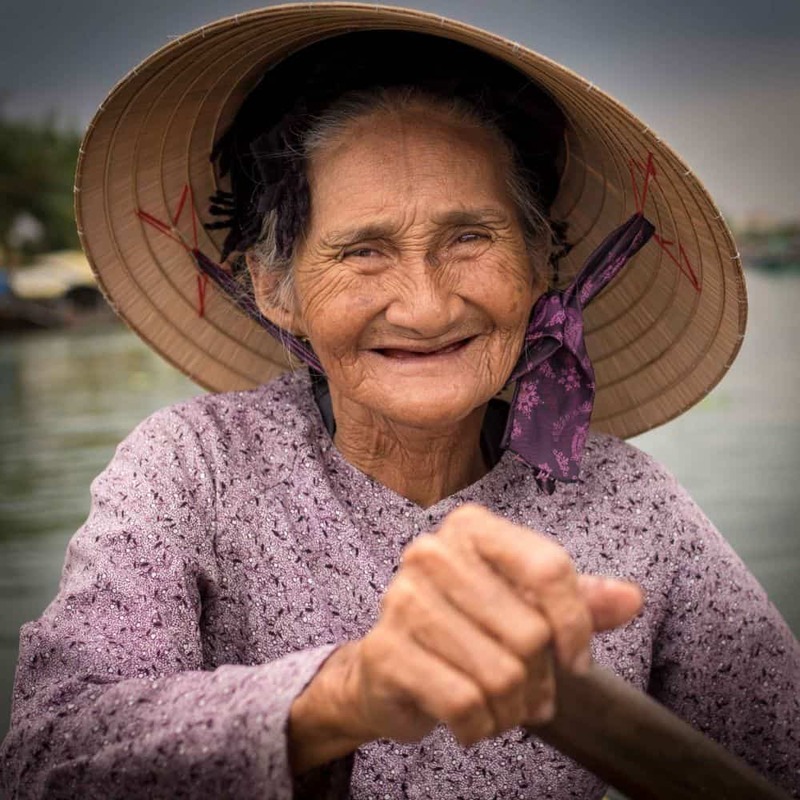 For those needing to return home quickly, there are regular flights with the Qantas Group airline Jet Star back to Hanoi. 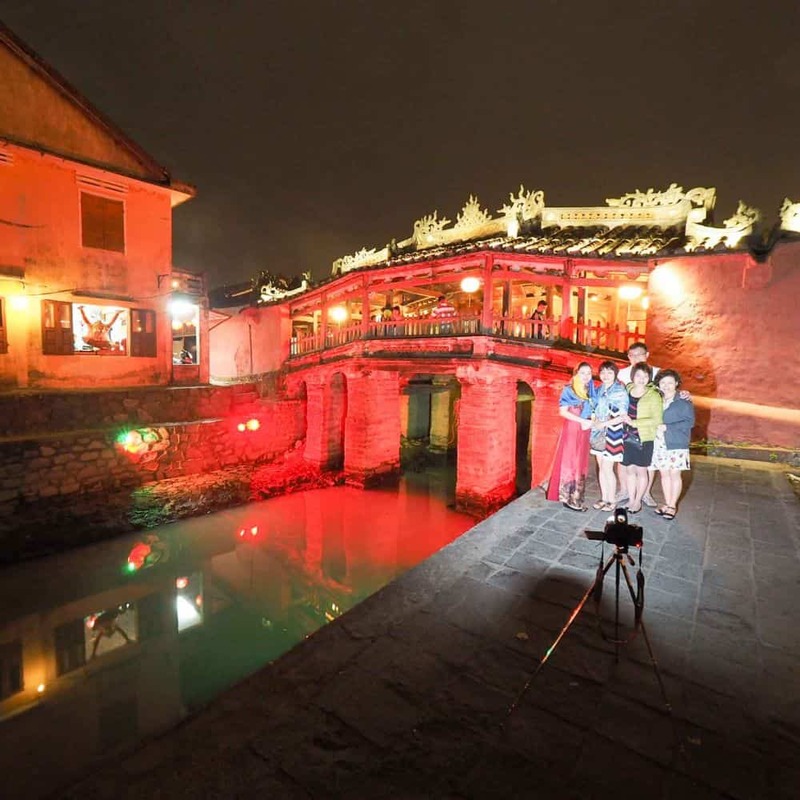 We are able to help with information, advice and the booking of extra nights in Hoi An. For onward flights, we suggest looking at www.jetstar.com. 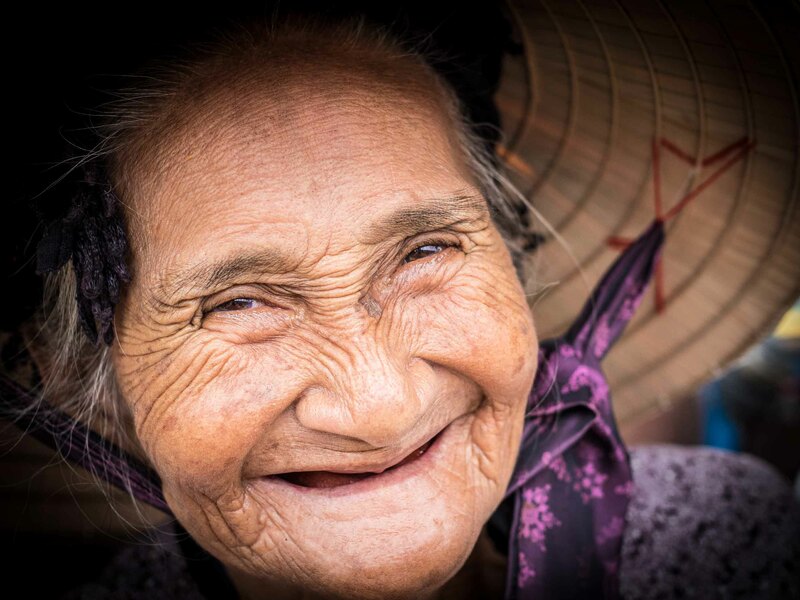 Please remember that the nearest airport is Da Nang. 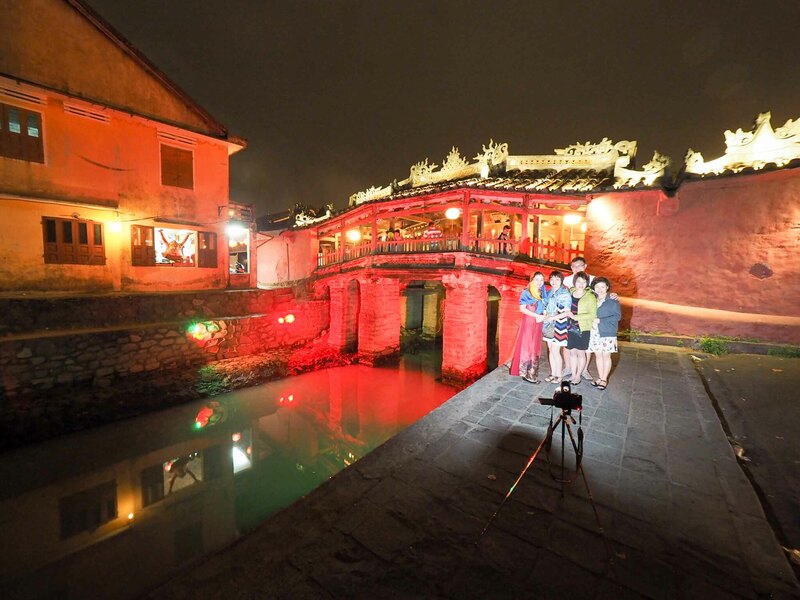 We are able to help with information, advice and the booking of extra nights in Hoi An. For onward flights, we suggest looking at www.jetstar.com. 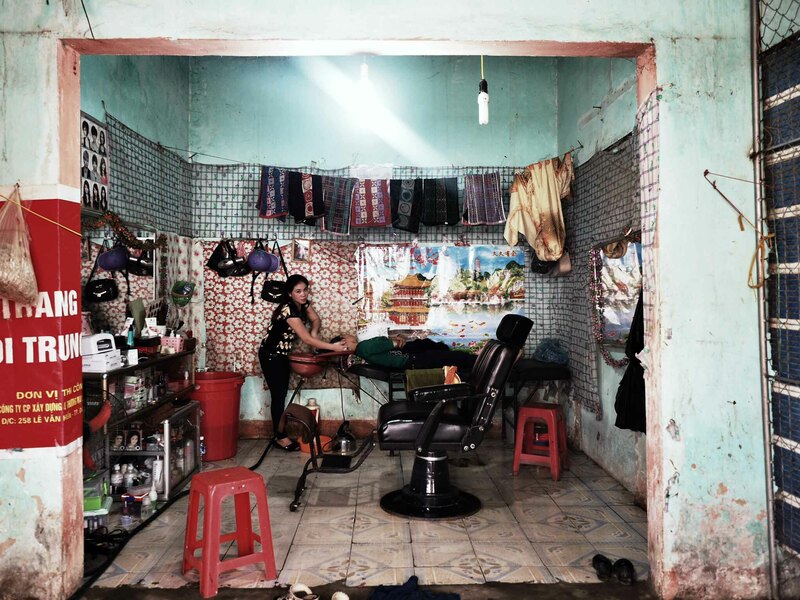 Please remember that the nearest airport is Da Nang half an hour away. For those leaving on the last day of the tour transport to the airport is included.